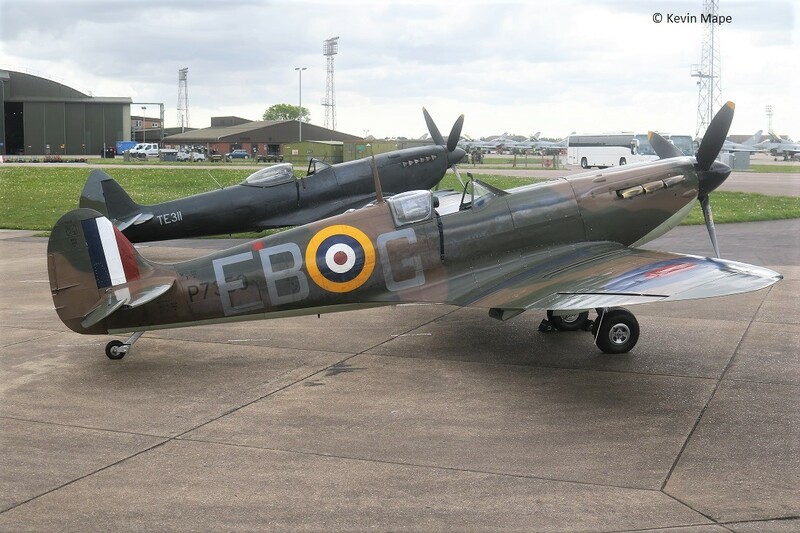 With PDA set for the second week of May I would think weather permitting the BBMF will be very active this month.The Spitfire LF XVIe TE311 is flying in a matt black undercoat fpr a few weeks until repainted at Coningsby. 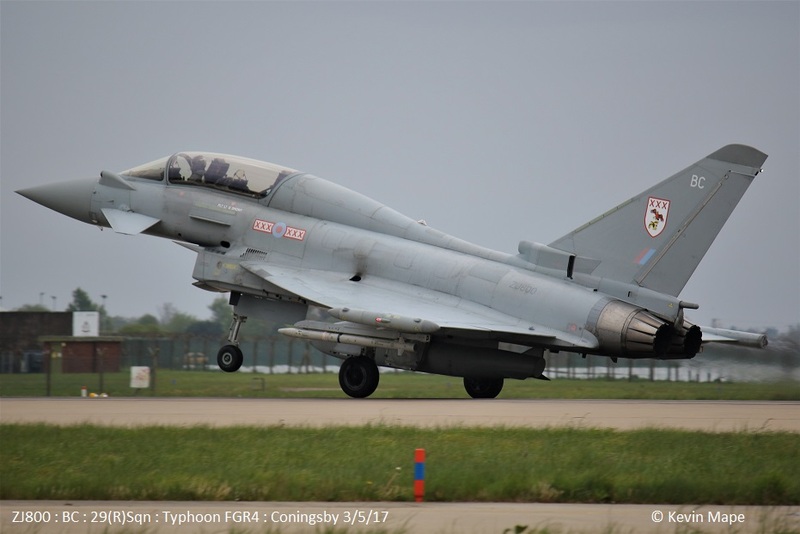 I think a lot of the rubbish regarding Flt Lt Ryan Lawson’s Typhoon 2017 Display on social Media are a bit unfounded, His display is coming on and will be just as good as any other I have seen over the years. 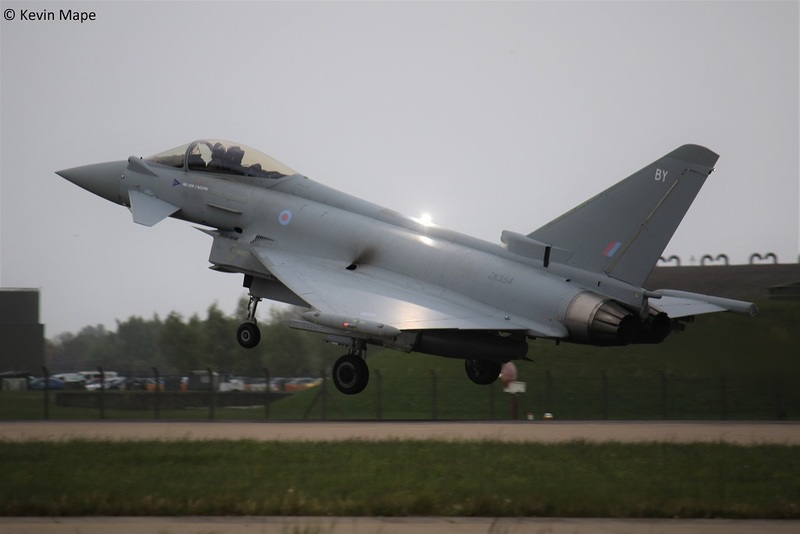 XI(F)Sqn are still away in Cyprus and with 3(F)Sqn away with four Typhoons in Romania on the NATO Baltic Air Policing,the South side might be a little quite this month. 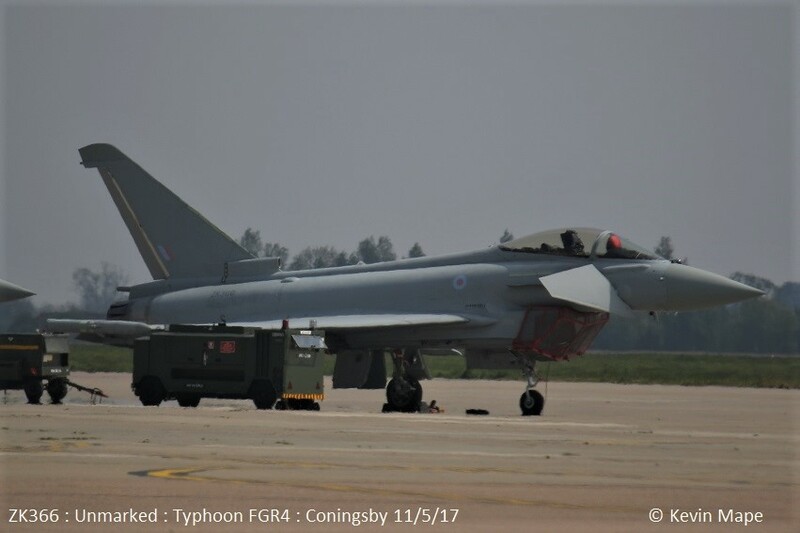 Typhoons are changing to the digit numbers of the serial at a growing rate with both XI(F)Sqn and 1(F)Sqn marked Typhoons loosing the marks last month. 2nd Tue. Log thanks to Steve, Val & Garf. 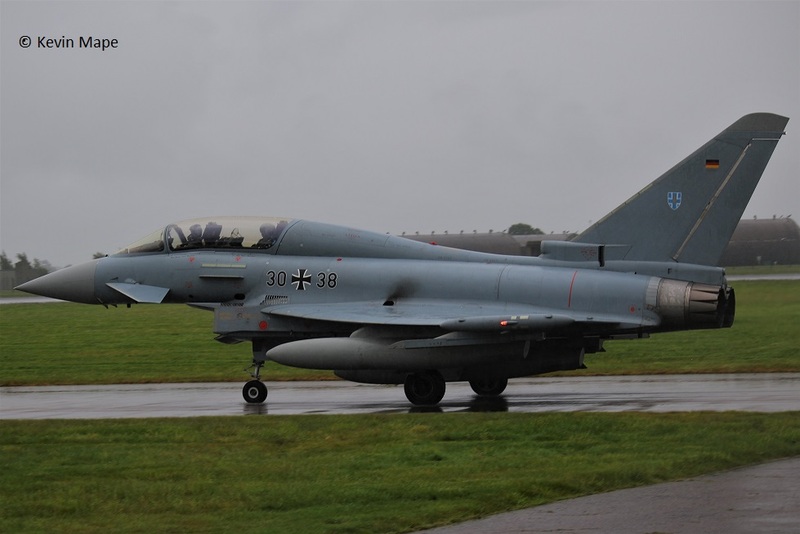 ASP – 29Sqn – 810,927,804,BG,BY,BC,BV,373,814,FY. 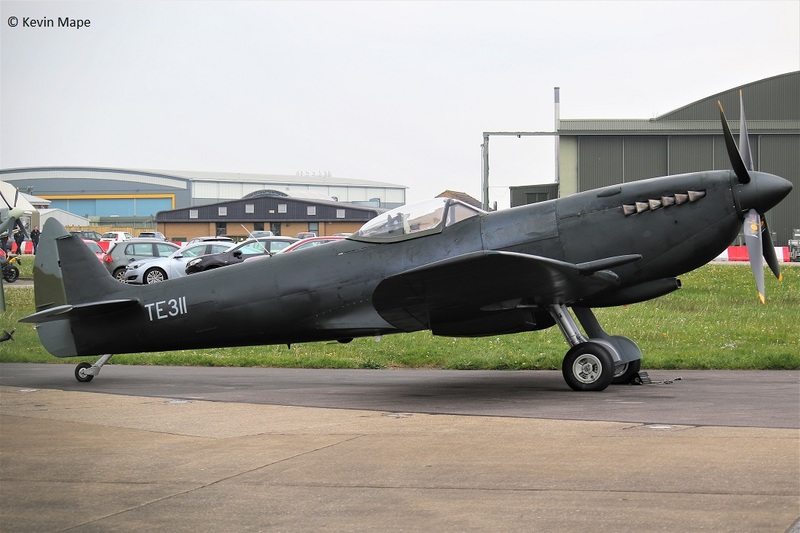 TE311/BBMF/Matt Black /Spitfire LF IXe – Parked outside BBMF. 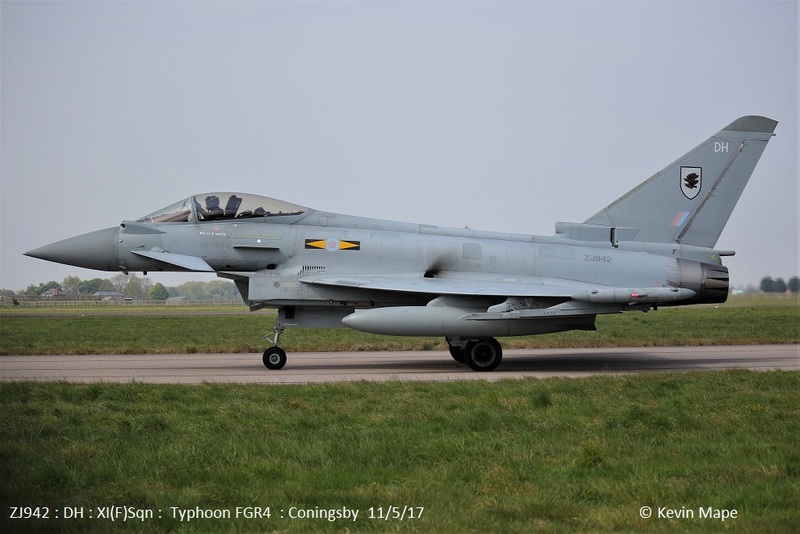 ZK325/325 code only c/s “Typhoon 20” PD at Leeming. G-MHAR/BAe Marham/Pa-42 – 700 Cheyenne IIIa c/s “GMHAR” – Parked on Sierra. n/s. 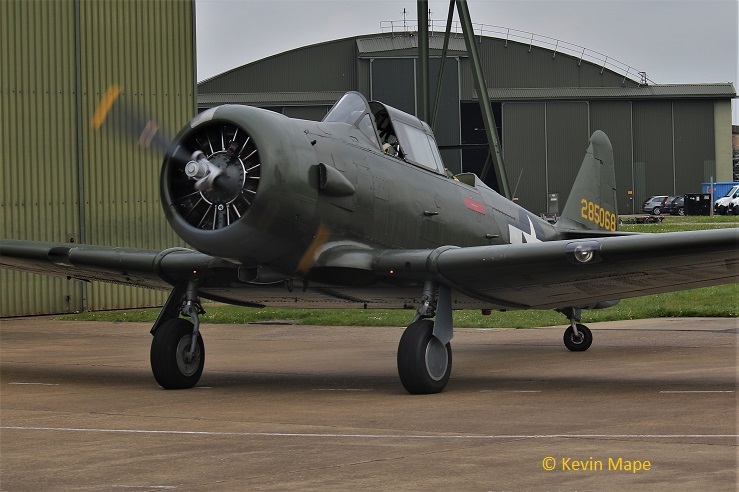 285068 ( G-KAMY )/AT-6D Texan c/s “Texan” – Hangared at BBMF – Loan. ZK348/FN code only – Towed to the APU shelter outside TMF. ZK353/BQ code only – Noted on the Wash pan. 3rd Wed Log thanks to Susie Matson & Dave. TE311, P7350 both put away by 8:45 due to high winds. 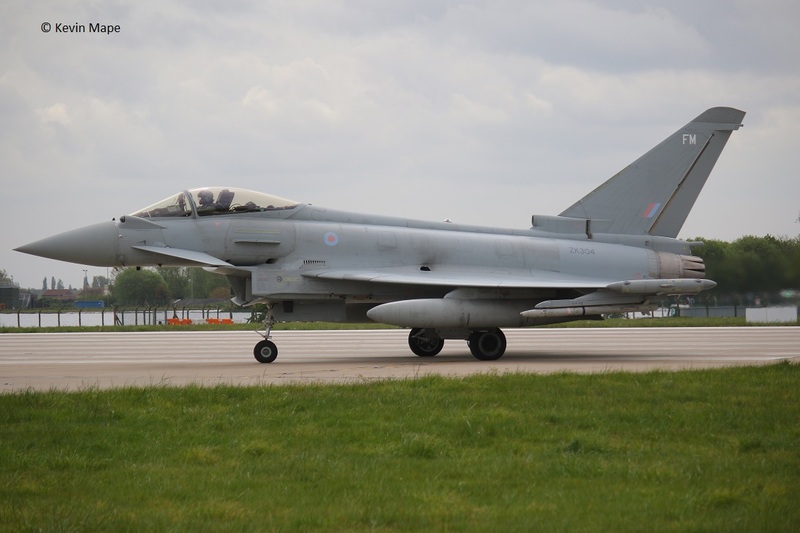 29(R)Sqn – 927, BE, 810,BY, 814, 804, BC, BV, 373, BG. 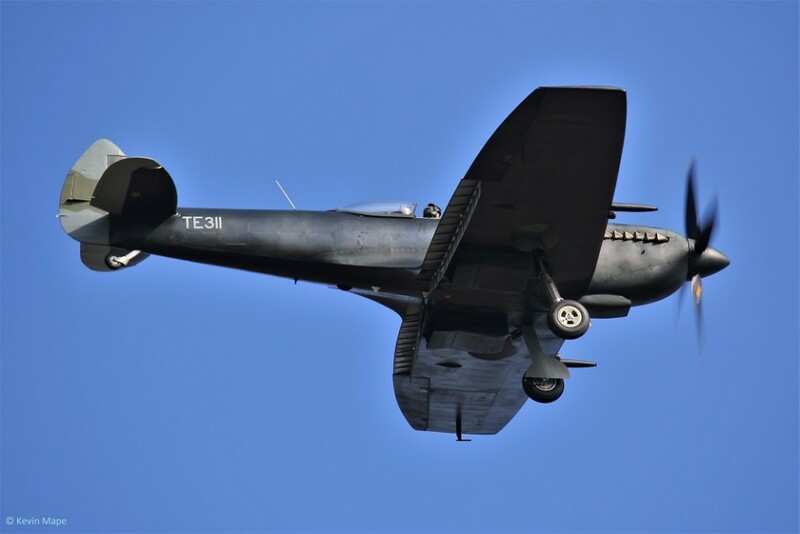 285068 (G-KAMY)/AT-6D Texan c/s “Texan” – Did flights (5) with BBMF ground crew members for short flights over Woodhall Spa. ZK315/ 41sqn 100yr special c/s “Apollo 12” landed with chute. ZJ916/S code only – Towed from TMF to Paint shop. 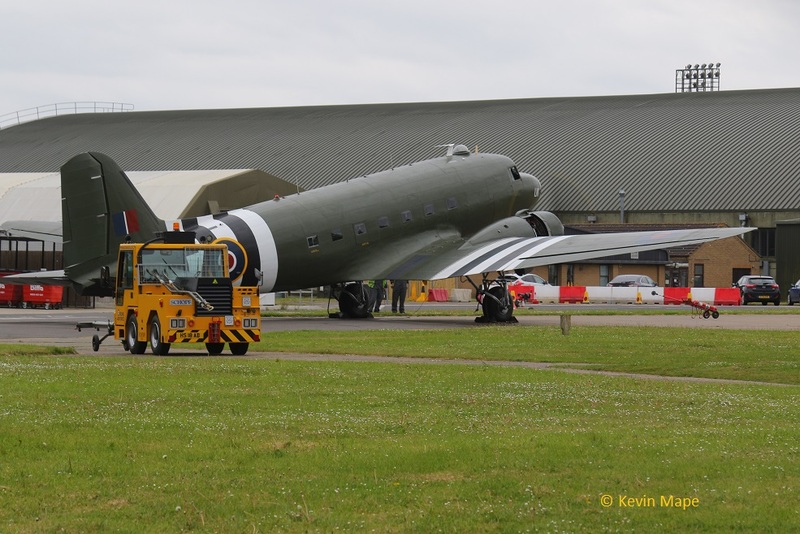 ZK380/380 code only – Towed from Paint shop to TMF f/n in code ex II(AC)Sqn/T. 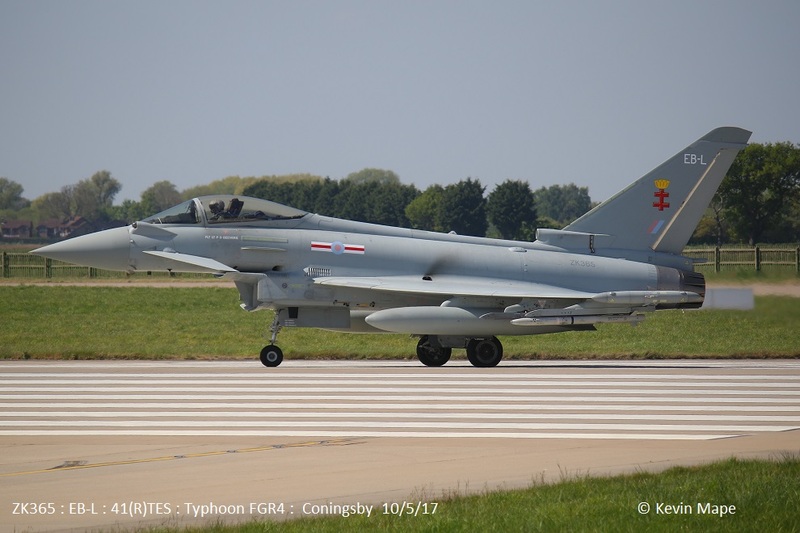 ZK362/BV code only c/s “Typhoon 45” – display – Bird strike on landing. 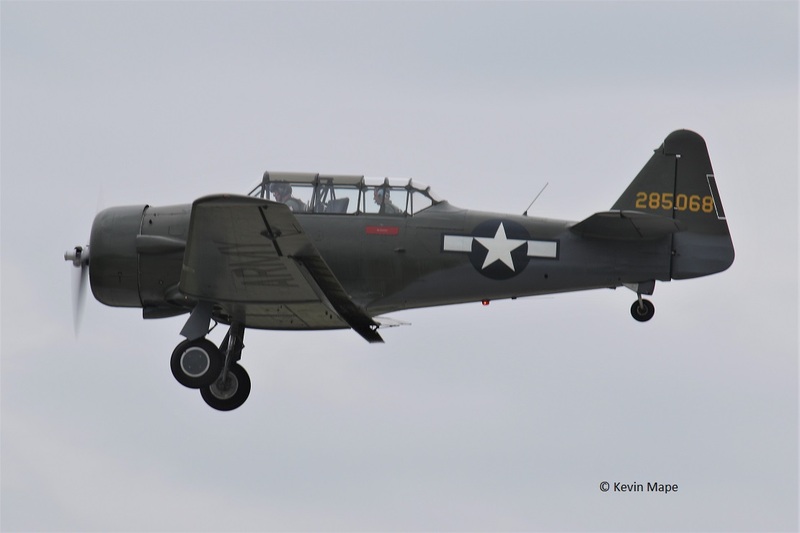 285068 (G-KAMY)/.AT-6D Texan c/s “Texan” – Departed. 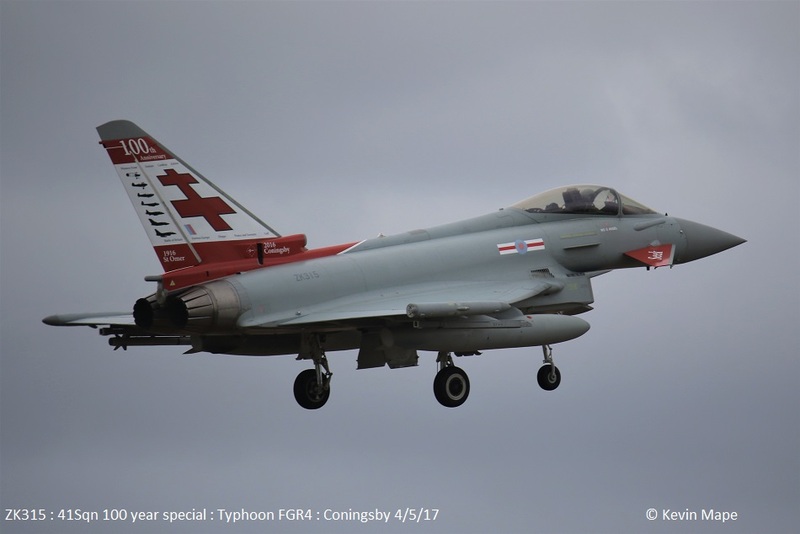 ZK325/325 code only c/s “Typhoon 01” – To Lossiemouth. 4th Thur Log thanks to Susie. 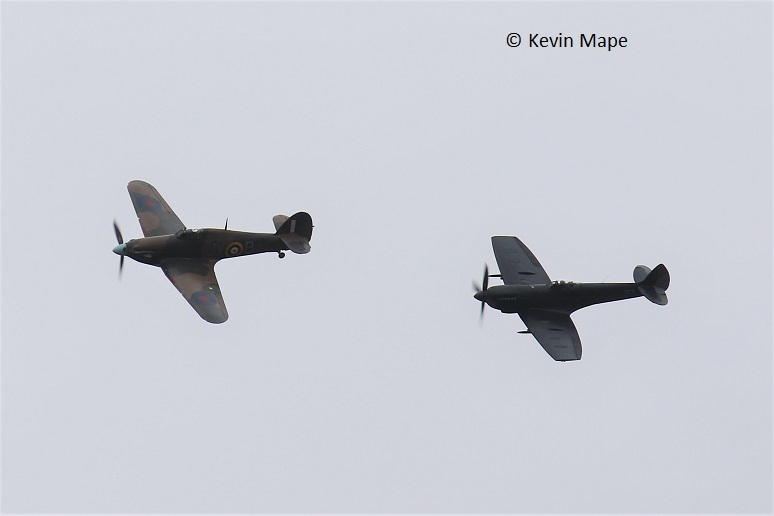 LF363/JX-B/BBMF/Hurricane IIc c/s “Hurricane 90” – Ground abort. No.089/YJ/EAT00.319/Xingu c/s “Cotam 1717” – parked on Sierra. No.089/YJ/EAT00.319/Xingu c/s “Cotam 1717” – Departed. 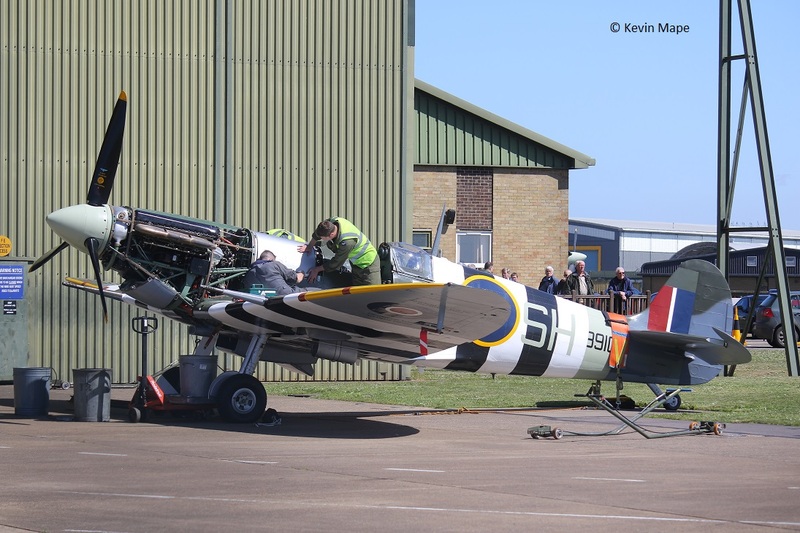 P7350/EB-G/BBMF/Spitfire IIa – Engine run. 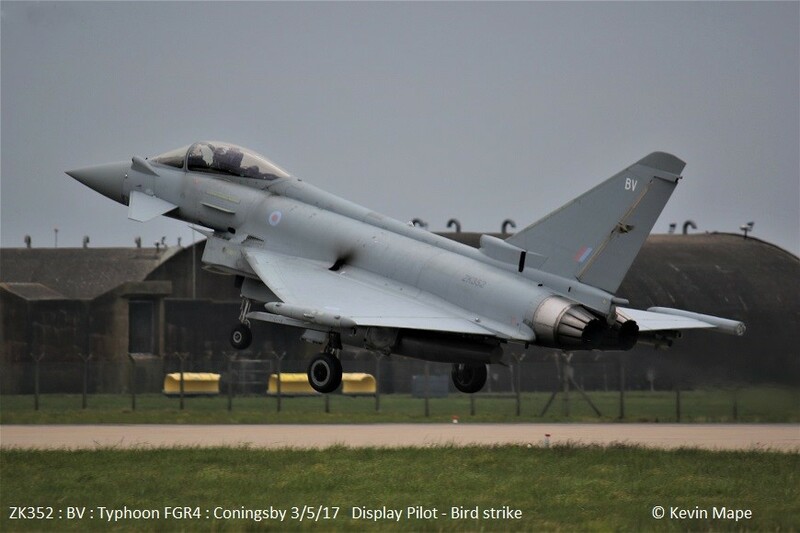 “Gunfighter 71” – Ground abort. ZK373/373 code only c/s “Triplex 51” – on catch up. 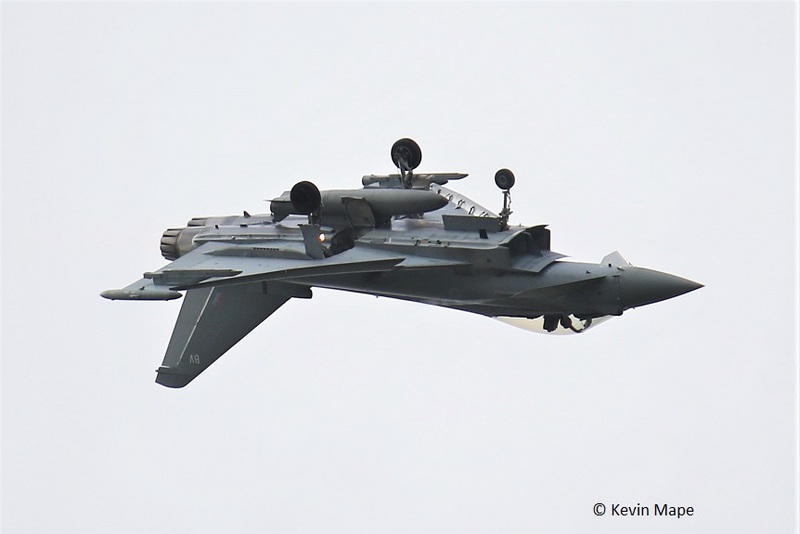 ZA607/EB-X/41(R)TES/Tornado GR4 – Engine run on the ASP..
ZK325/325 code only c/s “Typhoon 01” – Return from Lossiemouth. 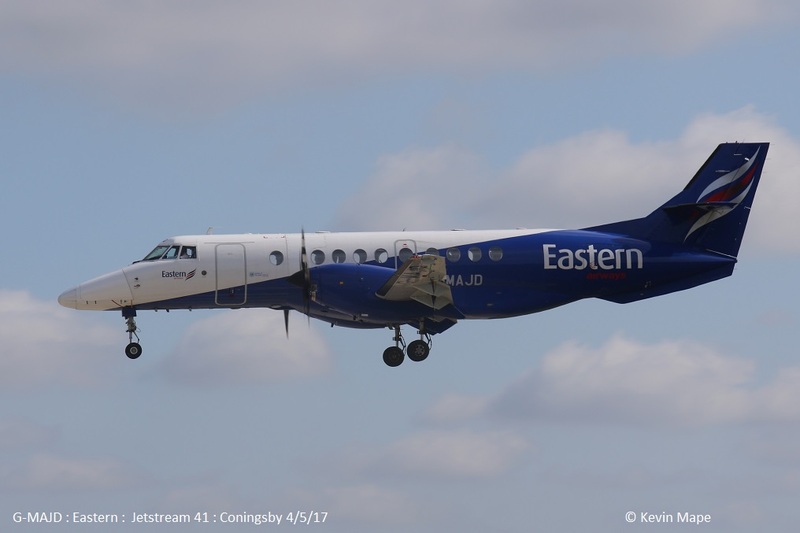 G-MAJD/JD/Eastern/Jetstream 41 c/s “Eat flt 105” in “106” – out. 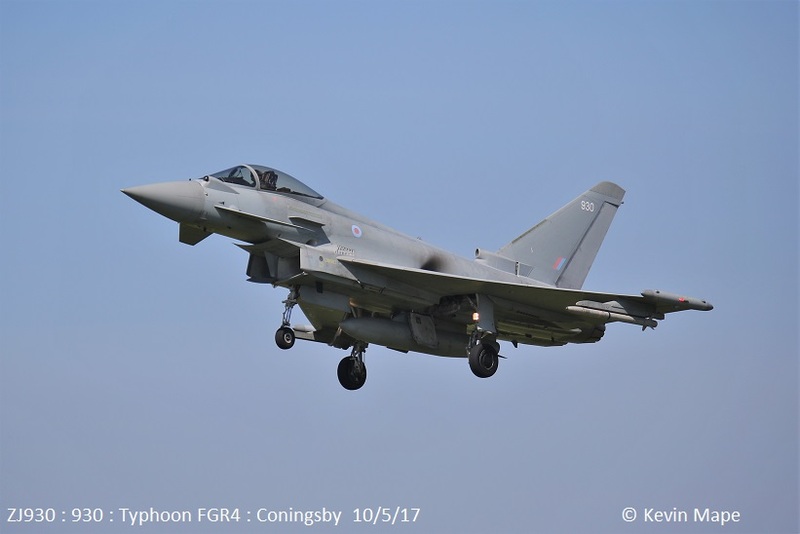 ZK382/BG/29(R)Sqn c/s “Warlord 41” – Single dummy Paveway. ZK383/FY code only c/s “Warlord 42”- Single dummy Paveway. 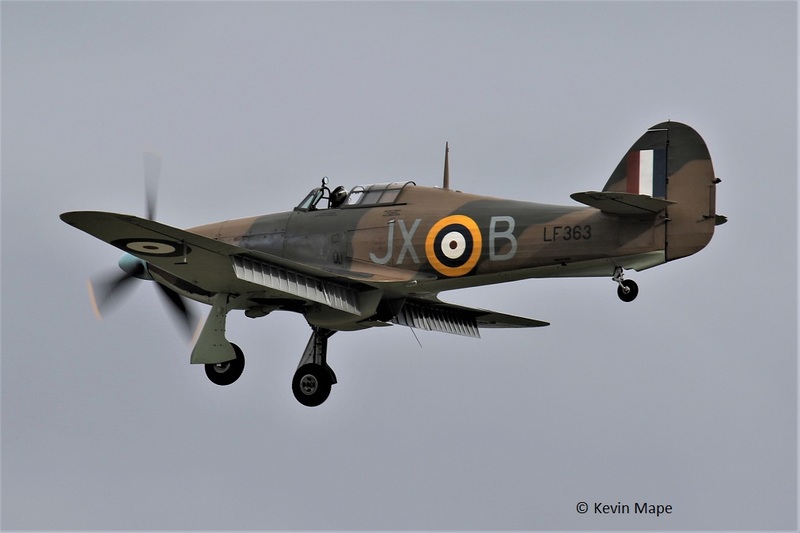 LF363/JX-B/BBMF/Hurricane IIc c/s “Hurricane 90” – First flight of the season. ZK307/O code only – Towed from TMF to the ASP. 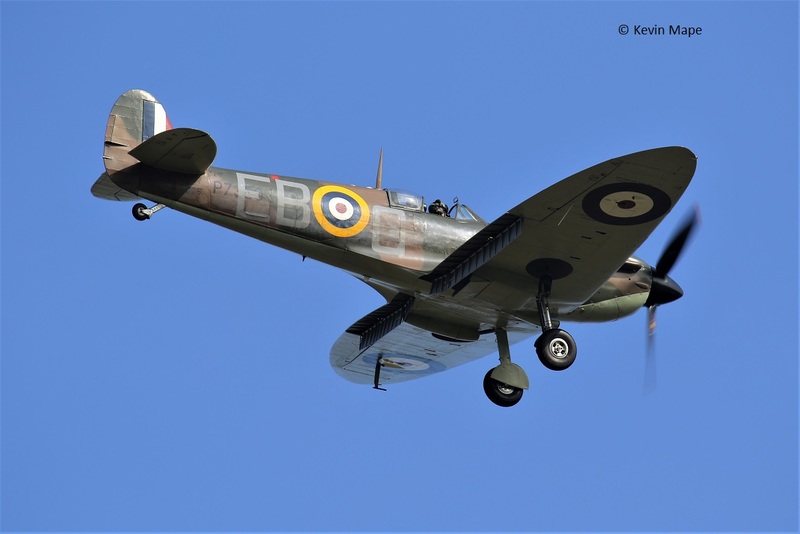 LF363/JX-B/BBMF/ Hurricane IIc c/s “Spitfire 96” – To Woodhall. 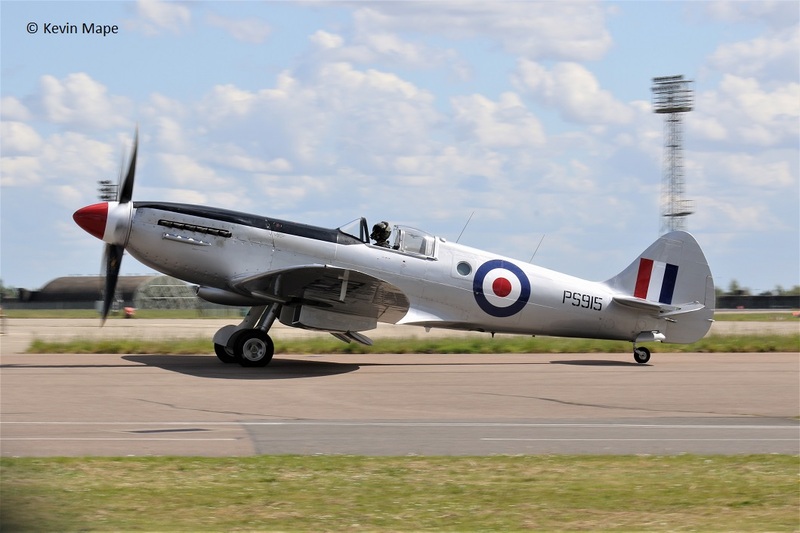 TE331/Spitfire LF XVIe – Engine run. 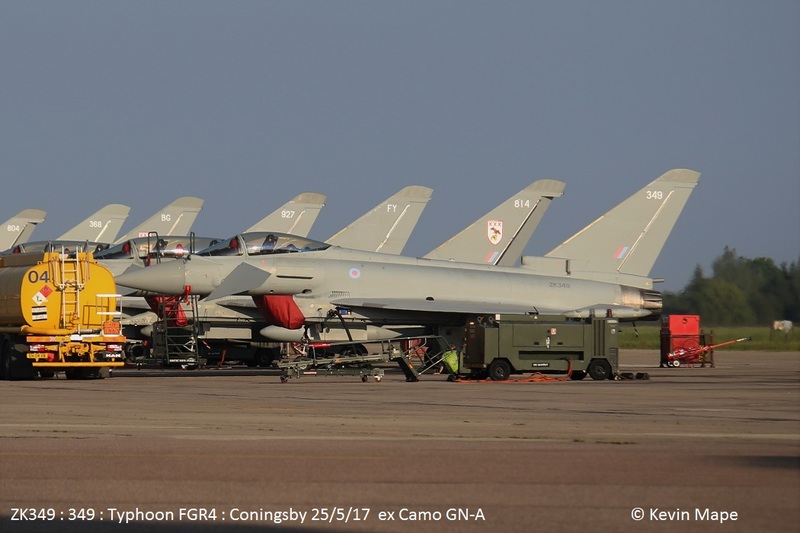 3(F)Sqn – FM, BQ, ER, 325. 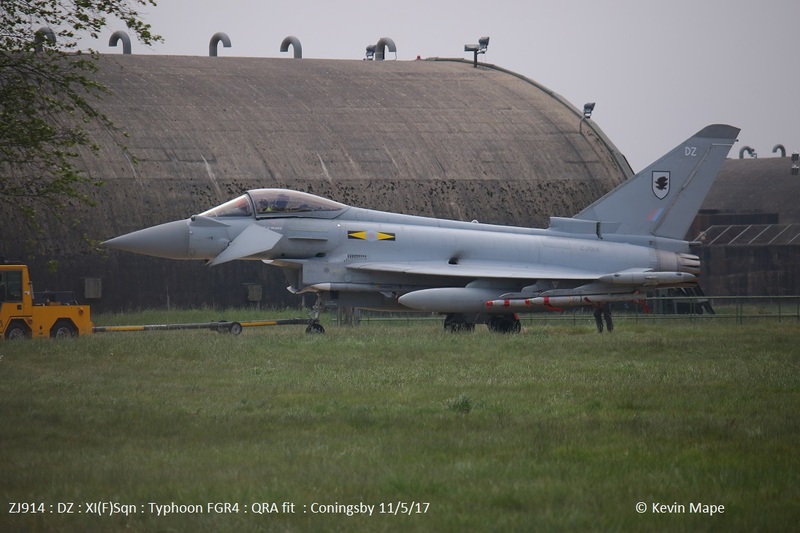 ZA607/EB-X/41(R)TES/Tornado GR4 – Noted on the ASP. 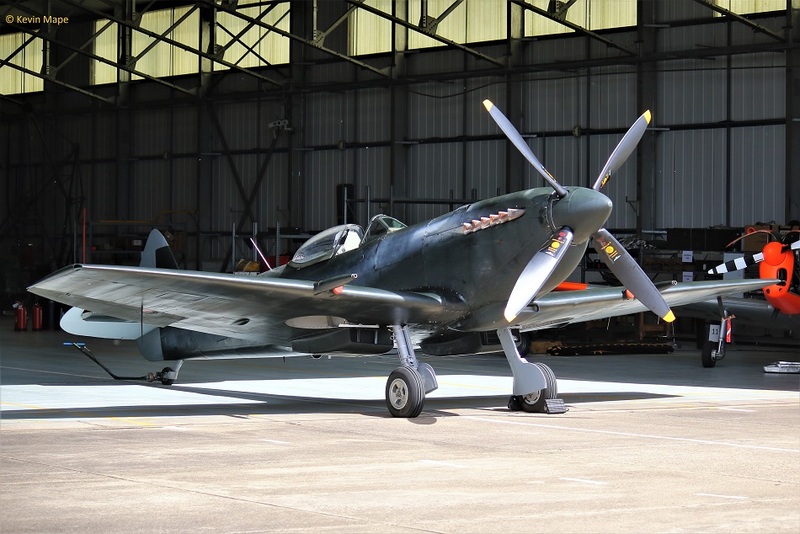 P7350/EB-G/Spitfire II a – Parked on the apron. 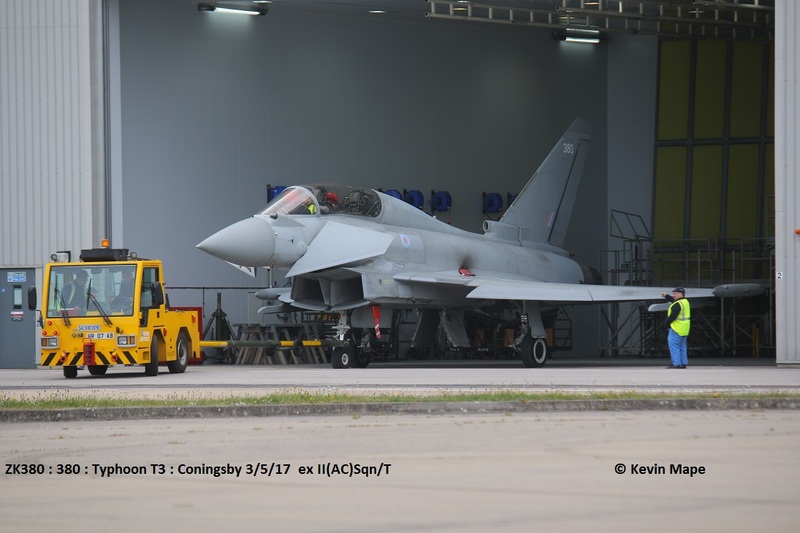 ZJ916/S code only – Noted in the paint shop – The paint have been taken back past the normal black paint, It was towed back to the TMF to assess the damage that had been done. 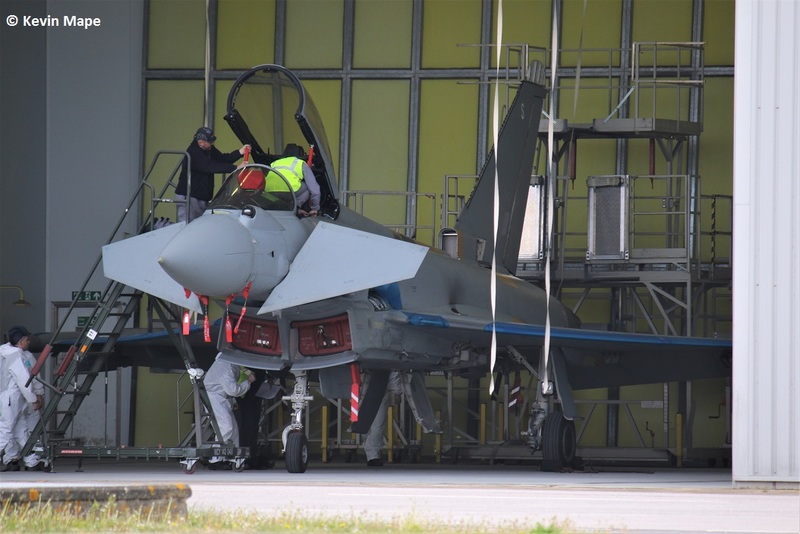 ZA559/049/Unmarked /Tornado GR4 – Towed from 41 Hangar to HAS 10 in Echo. ZK380/380 code only – Towed out of Hangar 2 to the ASP. 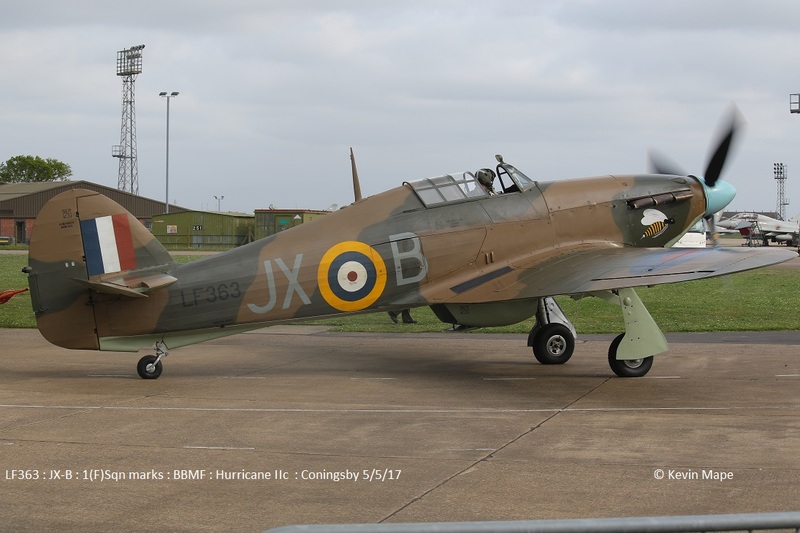 LF363/JX-B/Hurricane IIc c/s “Hurricane 01” – Display cancelled due to high winds. ZJ815/EB-H/41(R)TES – Towed back into Hangar 2. ZK380/380 code only – Towed back into Hangar 2. 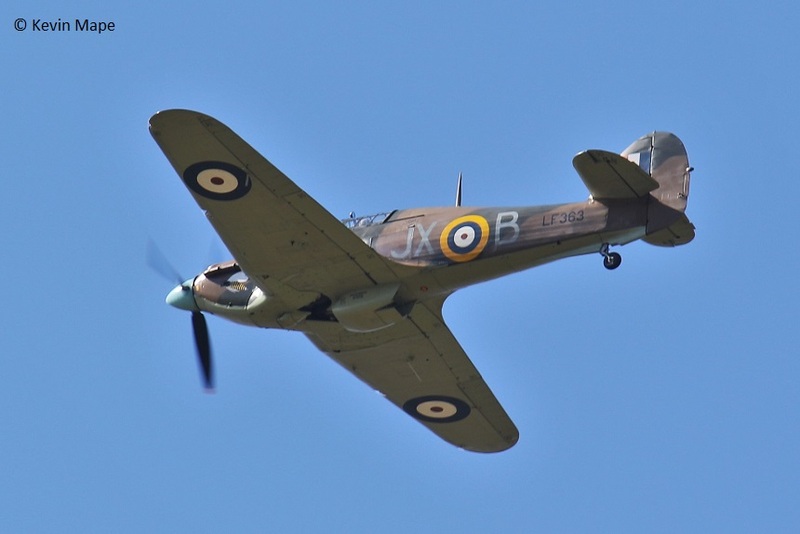 LF363/JX-B/Hurricane IIc c/s “Synchro 1” – Display. 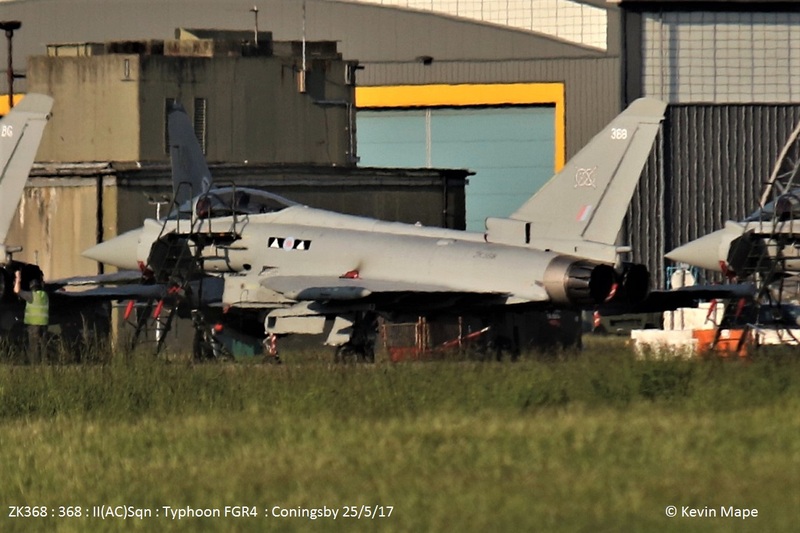 ZA559/049/Unmarked /Tornado GR4 – Towed back to 41 Hangar. 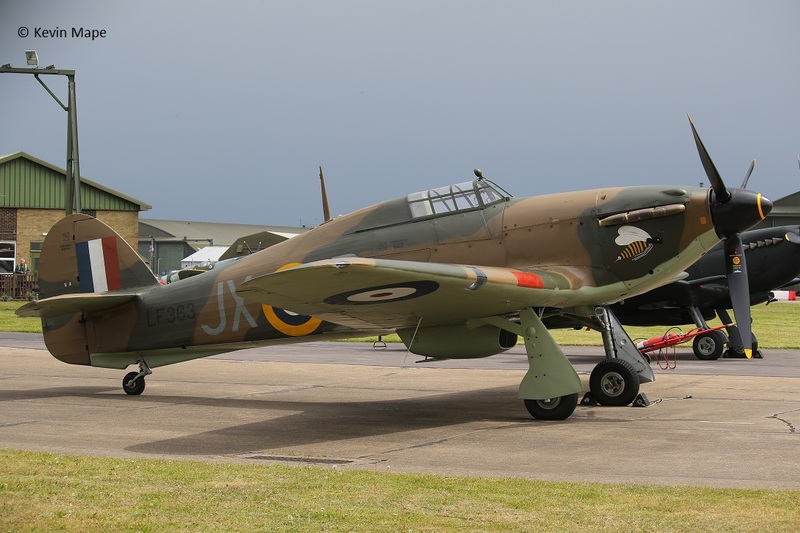 LF363/JX-B/Hurricane IIc c/s “Hurricane 02” – Display. ZJ930/930 code only – Towed to the Wash pan. 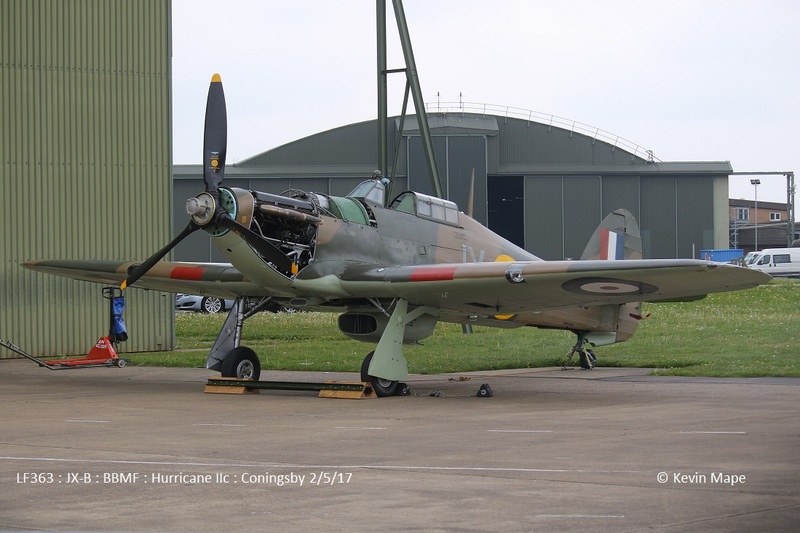 LF363/JX-B/Hurricane IIc c/s “Hurricane 01” – Display. 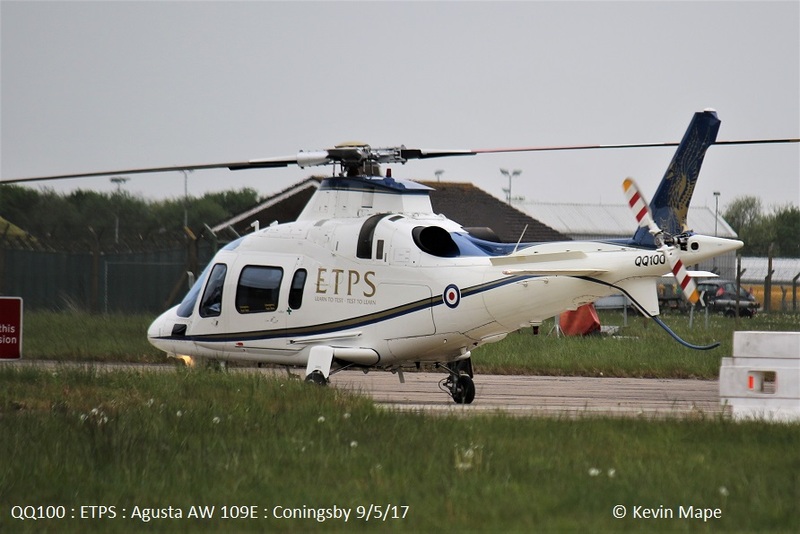 QQ100/ETPS/ A109E c/s “Gauntlet 36” – Parked on Sierra. 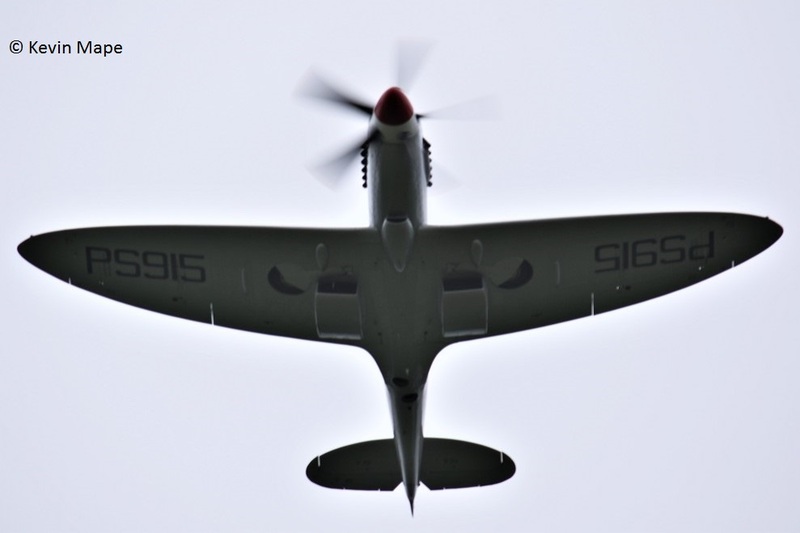 TE311/Spifire LF XVIe c/s “Syncro 1 ” – Ground abort. 10th Wed Log thanks to Susie. ZJ930/930 code only c/s “Triplex 32” out “72” in sent back with fuel issue deployed chute. 11th Thur – Log thanks to Susie & Mark. 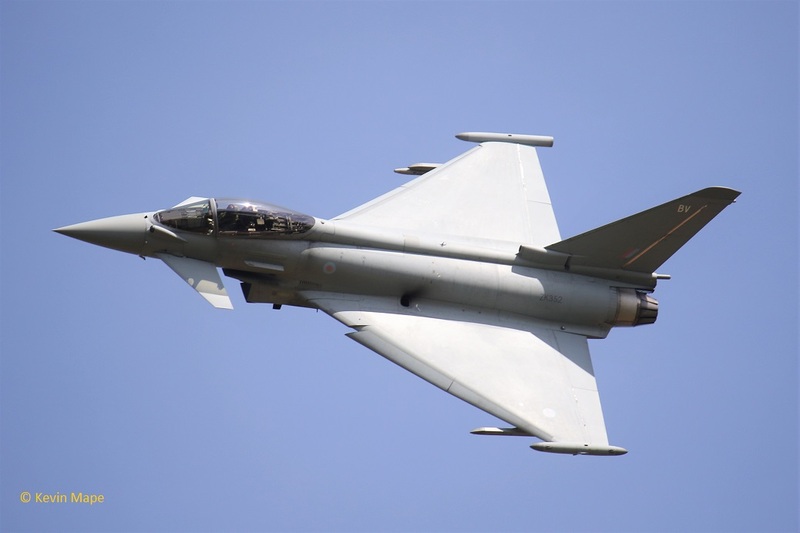 ZJ930/930 code only c/s “Typhoon 35” – To Cranwell for flypast. “Apollo 11 flt ” – ground abort. 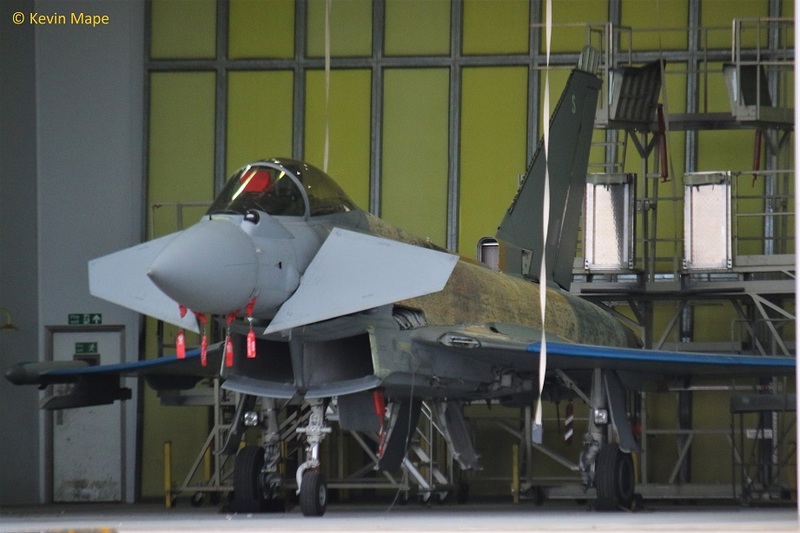 ZJ917/DG/XI(F)Sqn – Towed from HAS4 to HAS 1 – out. 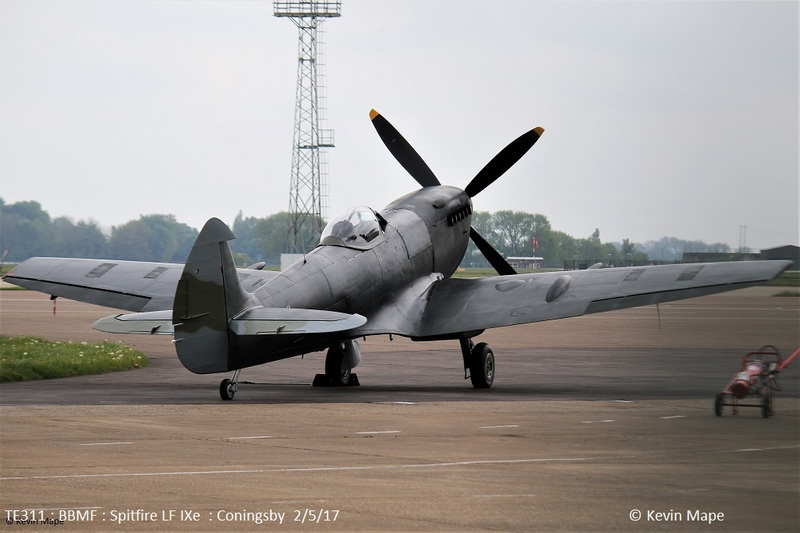 PS915/ Spitfire PR XIXe c/s “Spitfire 90” – f/f of the year. 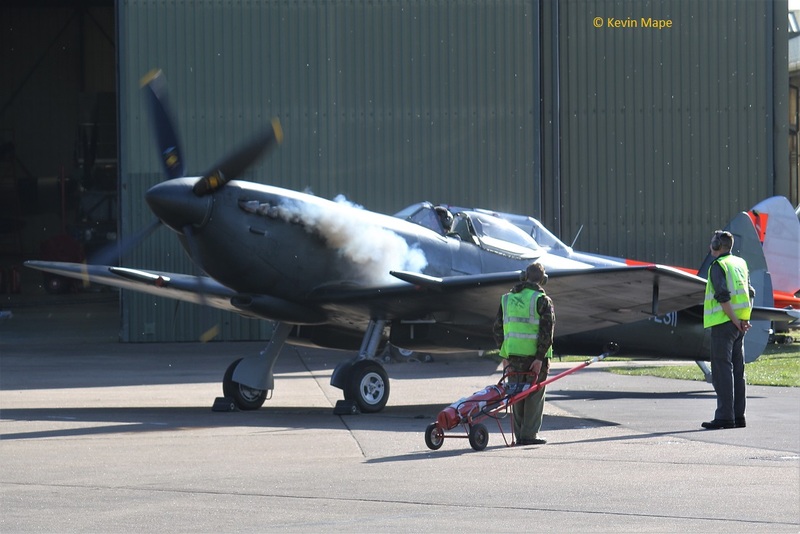 AB910/SH-F/Spitfire LF Vb – Engine run. 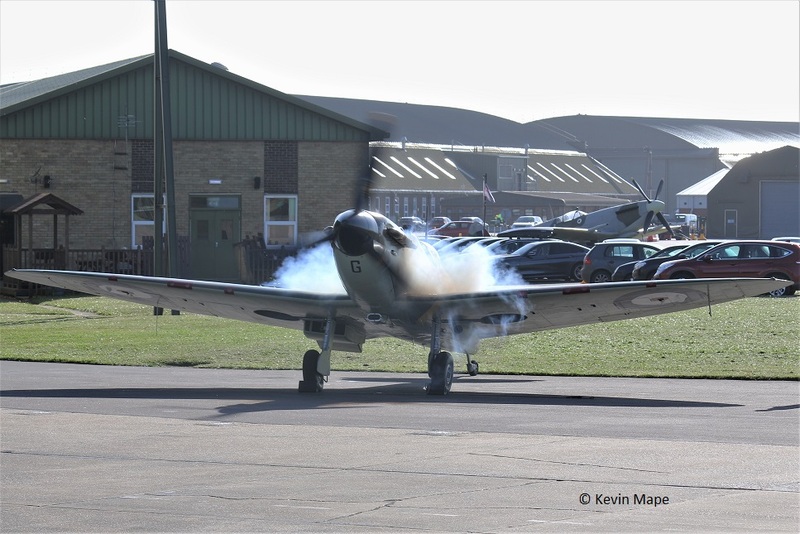 TE311/Spitfire LF XVIe – Engine run. 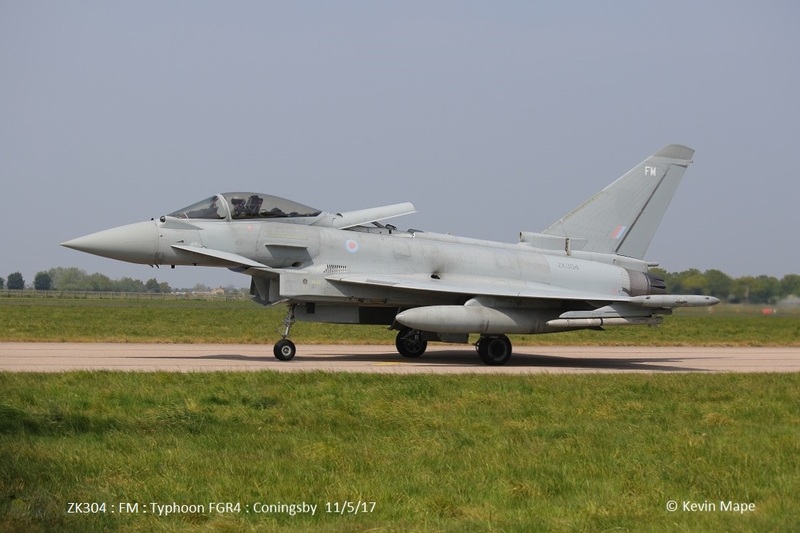 29(R)Sqn – FY, 930, BY, 373, 927, 381, 814. FY, 930, BY, 927, 381, BE, 814. 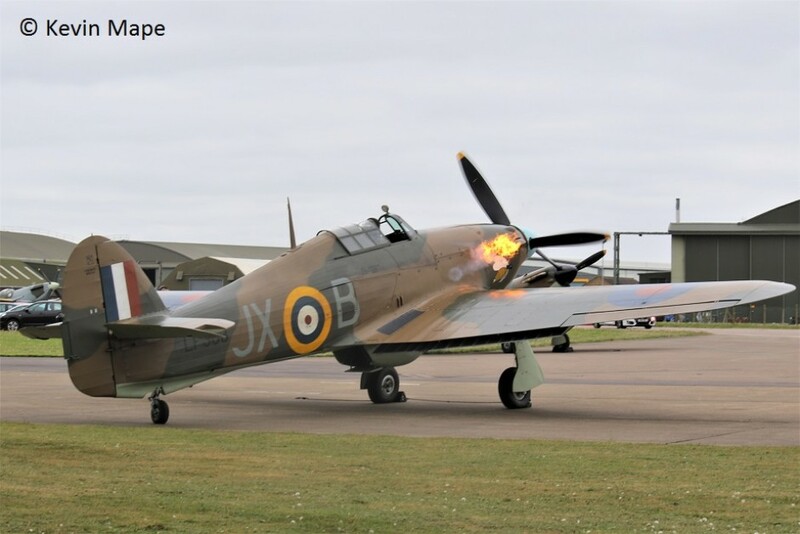 LF363/Hurricane IIc – Engine run. 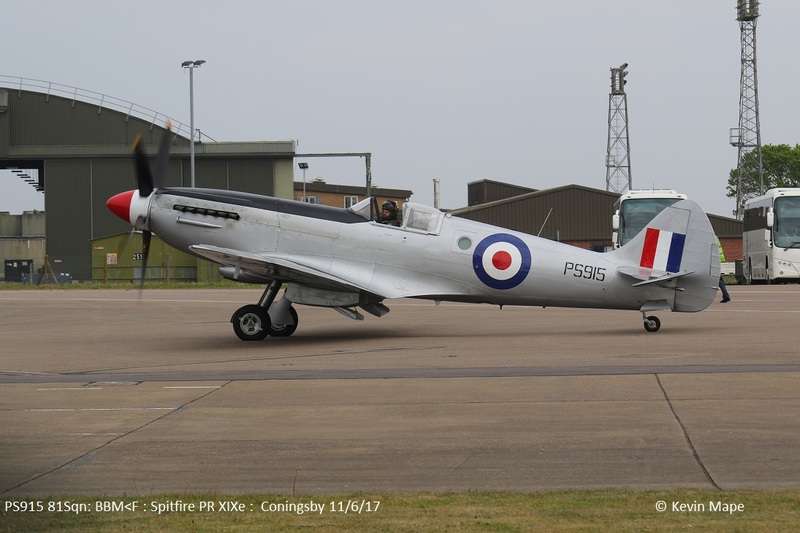 TE311/Spitfire LF XVIe c/s “spitfire 96” – Flypasts. 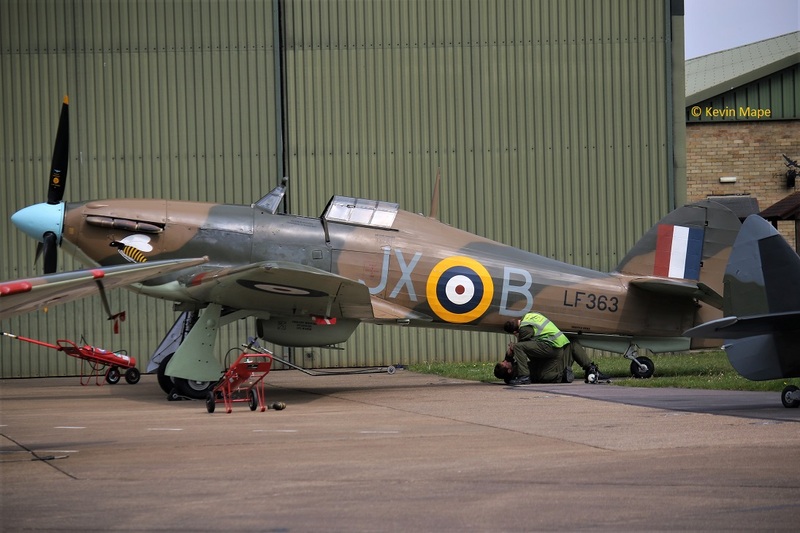 LF363/JX-B/Hurricane IIc – With it’s own Prop & Spinner. 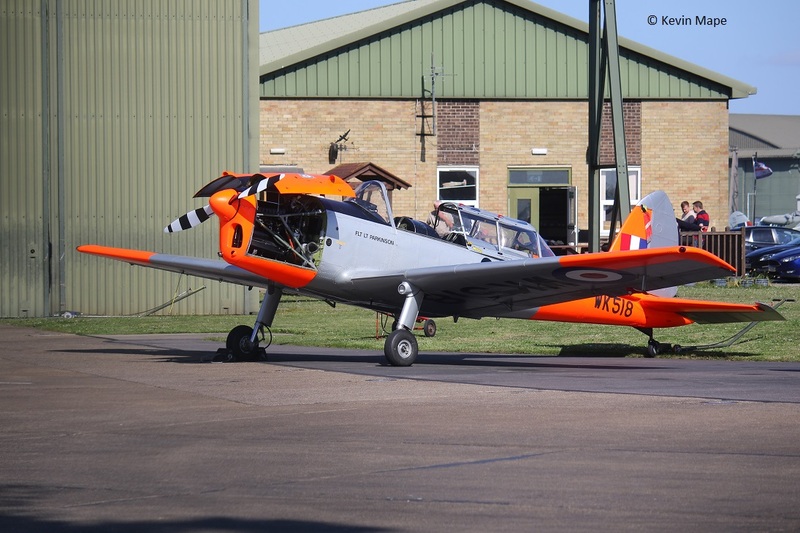 ZF264/264/1FTS//Tucano T1 c/s “Lima 20” – High overshoot. ZK325/325 code only c/s “Chaos 14” – all 4 Chaos hot pitted on return. 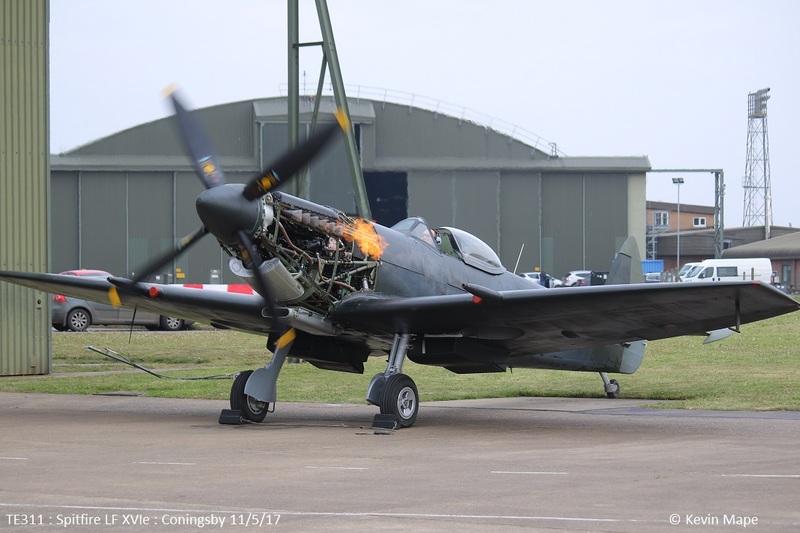 P7350/EB-G/ Spitfire IIa – Engine runs. ZK304/FM code only c/s “Chaos 11” – Trails PAR at Leuchars with “Chaos 12” at 14-34 & 14-35. 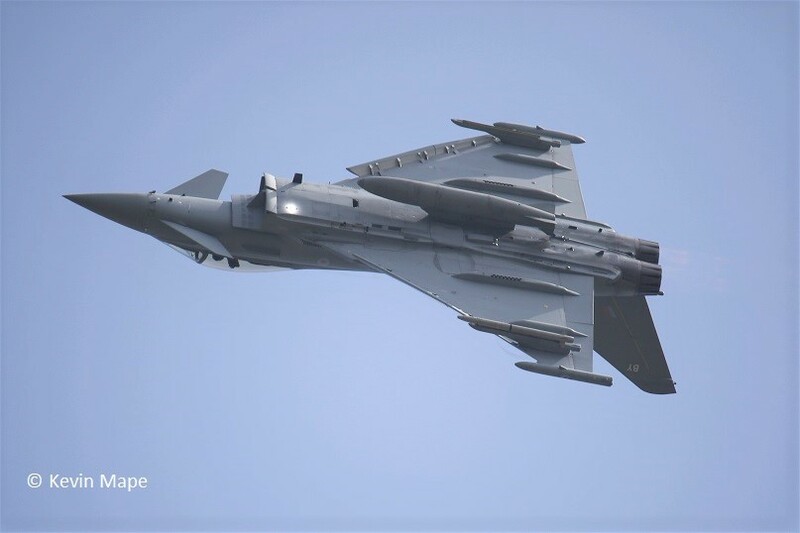 ZJ802/DW/XI(F)Sqn c/s “Chaos 13”- Trails PAR at Leuchars with “Chaos 14” at 14 – 44 & 14-45. ZK366/Unmarked – Towed from TMF to APU Tunnel. 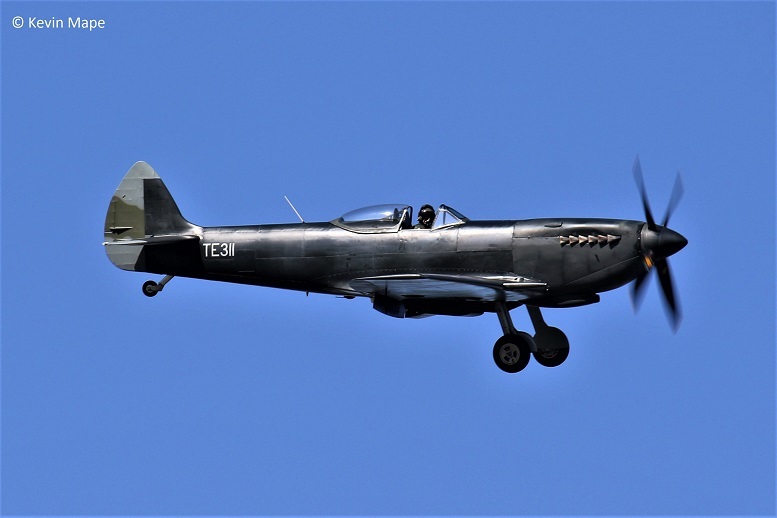 ZA607/EB-X/41(R)TES c/s “Rebel 87” – Test Flight. ZK553/Chinook HC6 c/s ” c/s “Vortex 397” – Parked on Sierra – then to Donna nook. ZK322/GS code only – Towed From Southside TMF to Northside. 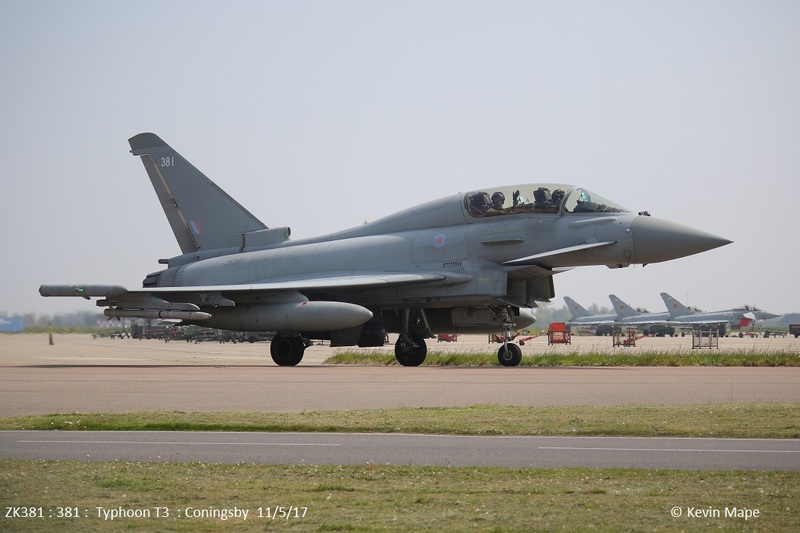 41(R)TES – EB-R, ZK351/SP, EB-G, Tornado EB-X. Sierra – ZK553 /Chinook HC6. 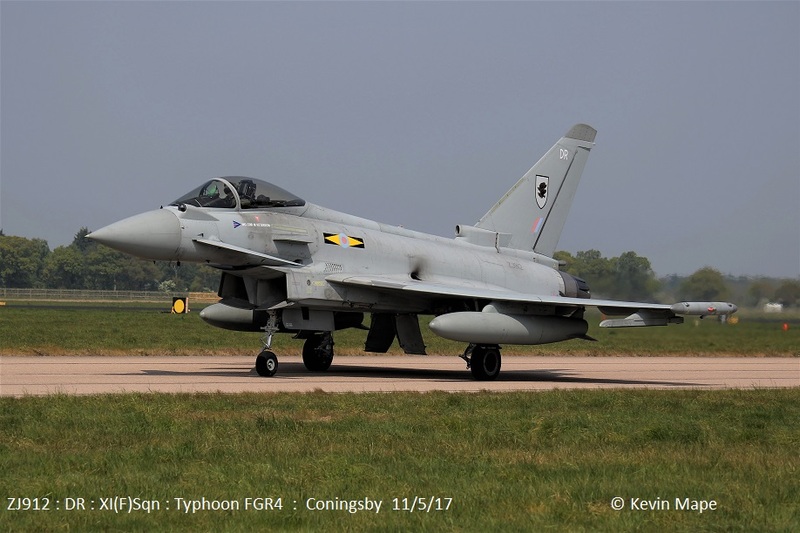 ZK352/BV code only c/s “Typhoon 65” – To Warton & returned. 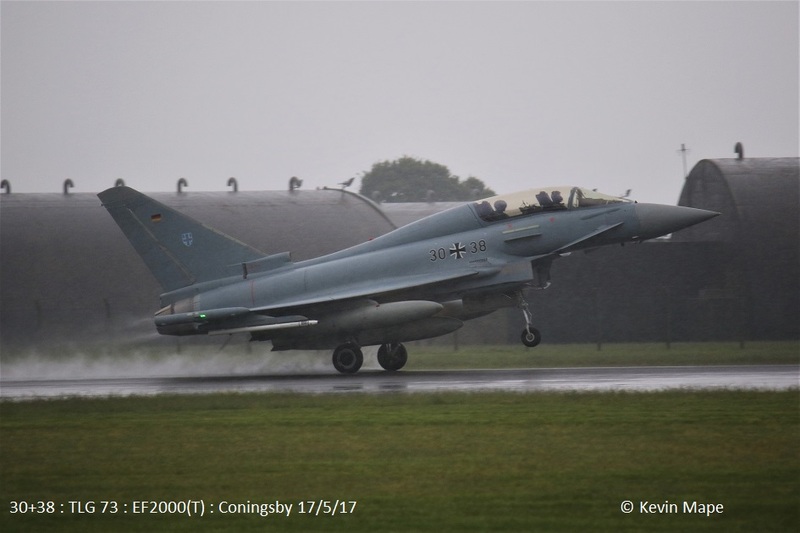 30+38/TLG 73/EF 2000 (T) c/s “German Air Force Sierra 01” – departed for home after n/s. Log ended 1pm – Due to heavy rain all day and the logger getting soaked. ZJ927/927 code only c/s “Triplex 22” – To Shawbury. 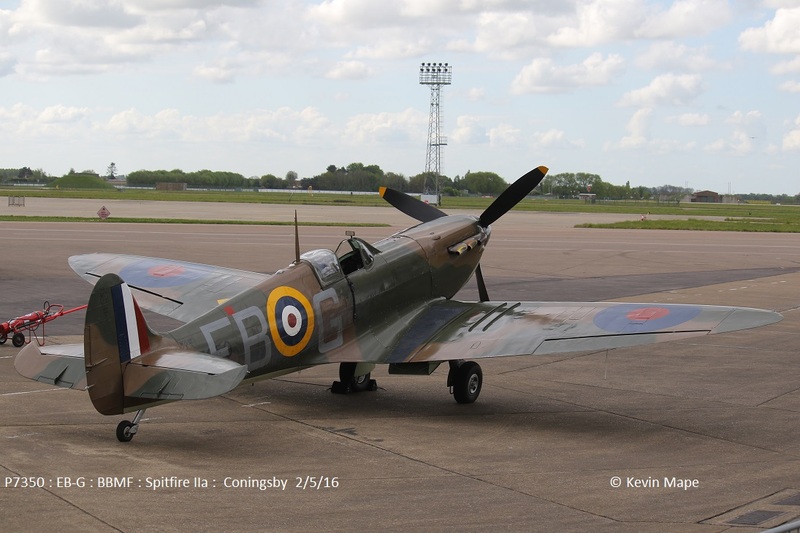 P7350/EB-G/BBMF/Spitfire IIa c/s “Spitfire 94” – To Cranwell. ZK553/7Sqn/Chinook HC6 c/s “Vortex 397” – parked on Sierra. G-FRAR/Cobham/Falcon 20EW c/s “Vader 61” – Mission. 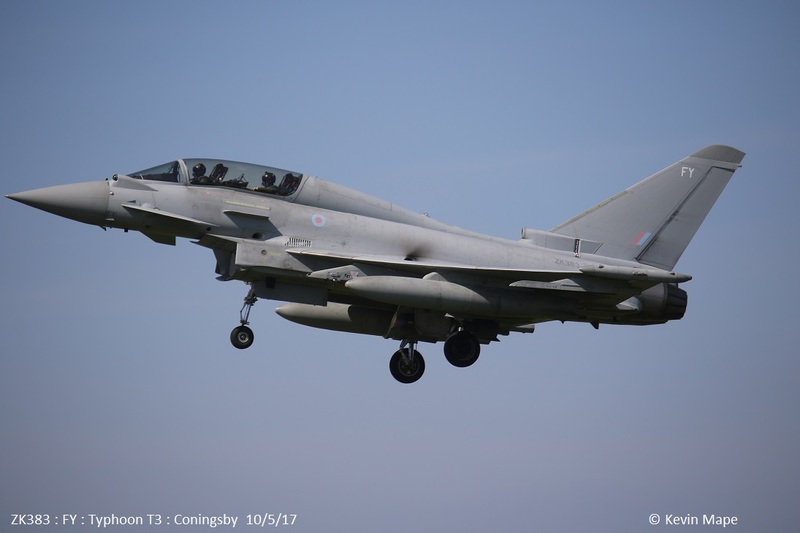 41(R)TES – EB-X tornado EB-L EB-R ZK315. ZK553/7Sqn/Chinook HC6 c/s “Vortex 397” – Departed. 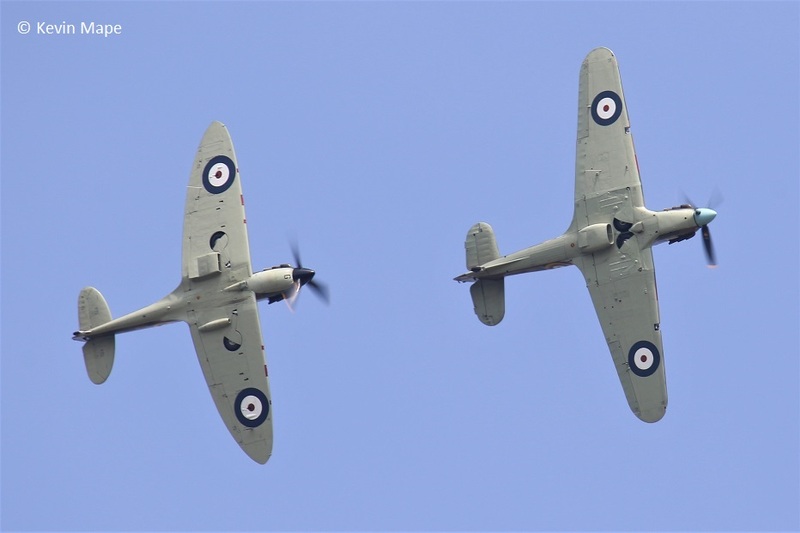 AB910/EB-G/Spitfire Vb c/s “spitfire 90” – Test flight. 22nd Mon Log thanks to Garf & Hans. 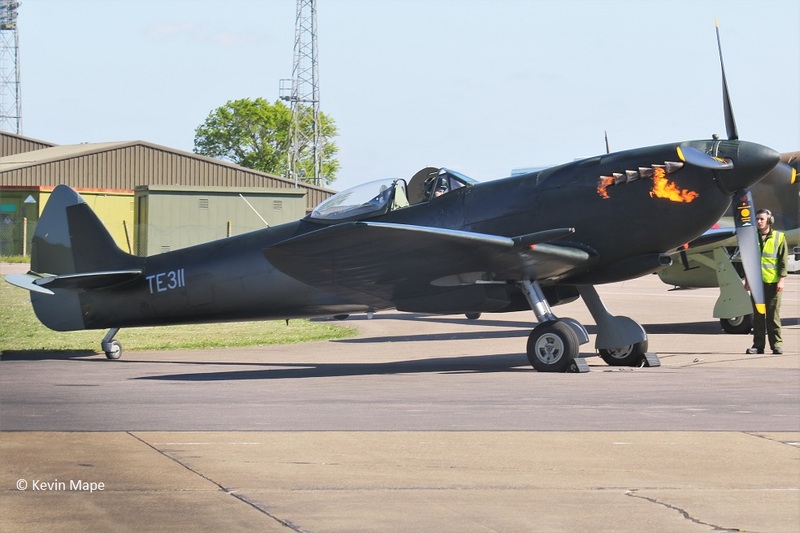 TE311/Spitfire LF XVIe c/s “Thompson 2” * made an emergency landing after a loose cowling hit the tail. 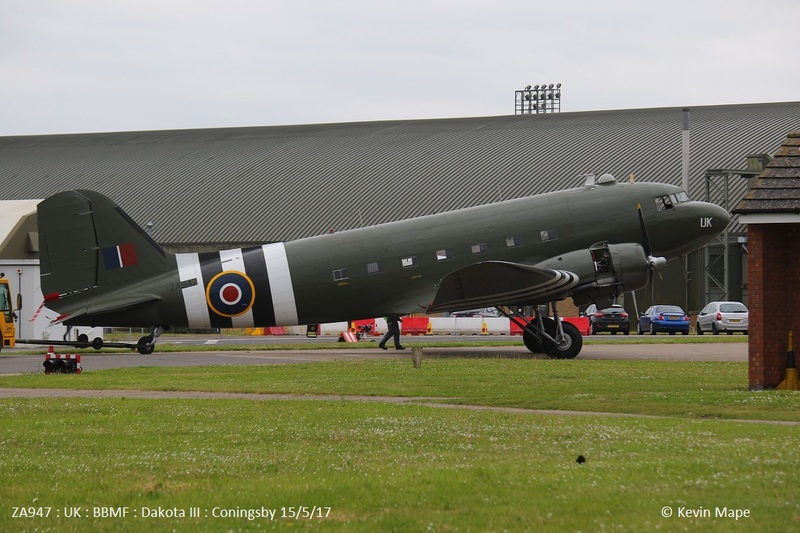 ZK342/342/6Sqn c/s “Lossie 37” – Parked on the ASP. 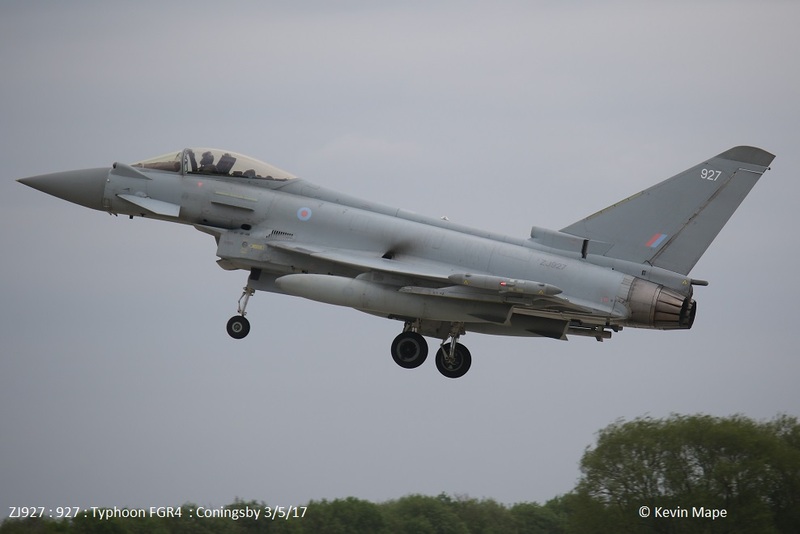 ZK377/Unmarked c/s “Tarnish 29” – Delivery from Warton. 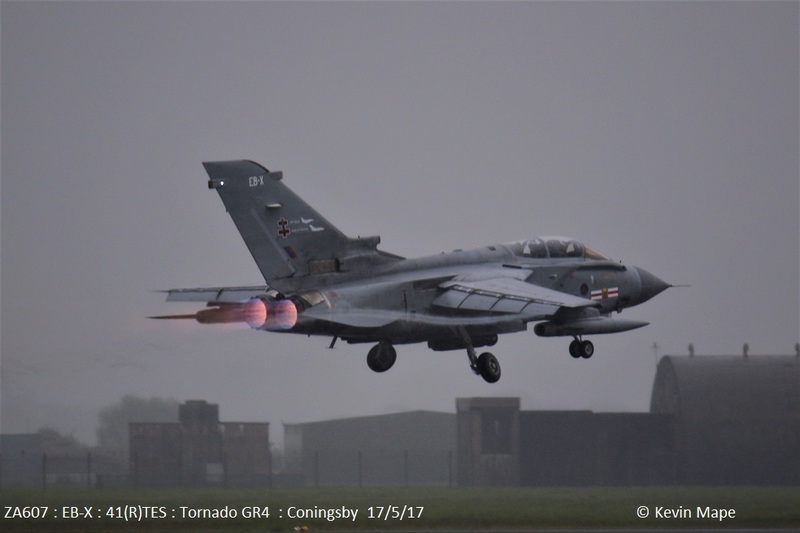 ZA607/EB-X/41(R)TES/Tornado GR4 c/s “Rebel 88” – To Donna Nook. G-FRAU/AU/Cobham/Falcon 20EW c/s “Zodiac 52” – Landed. 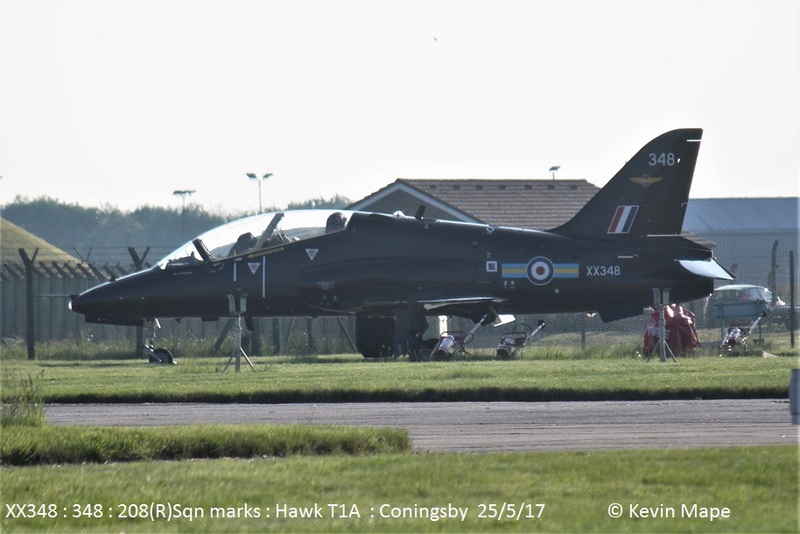 XX258/CE/100sqn/Hawk T1A c/s “Javelin 12” – Overshoot. 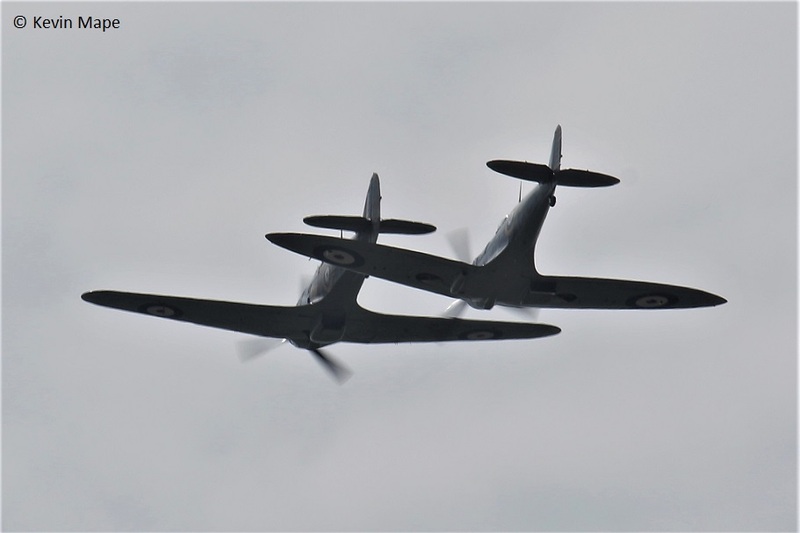 AB910/SH-F/Spitfire Vb – c/s “Thomson 1 – 4”- BBMF four ship display. Night flying 17-05 Log thanks to Garf. G-FRAU/AU/Cobham/Falcon 20EW c/s “Zodiac 51” – To the ASP. 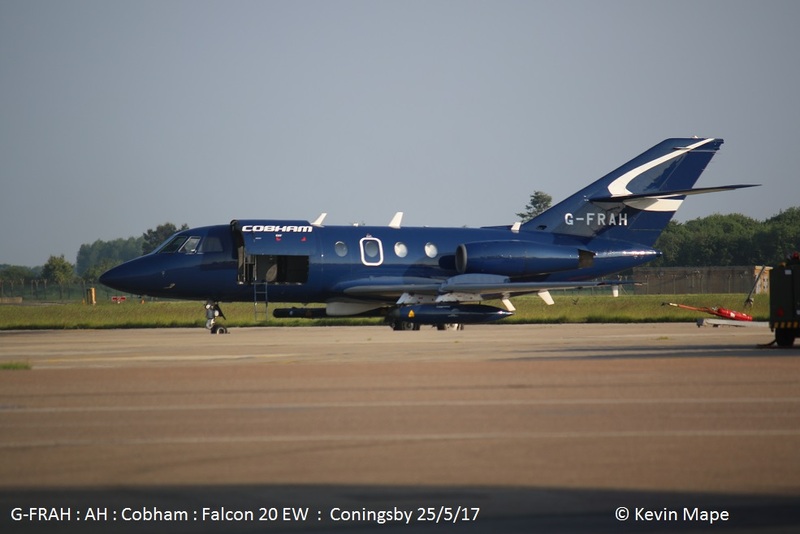 G-FRAH/Cobham/Falcon 20EW c/s “Zodiac 52” – To the ASP. 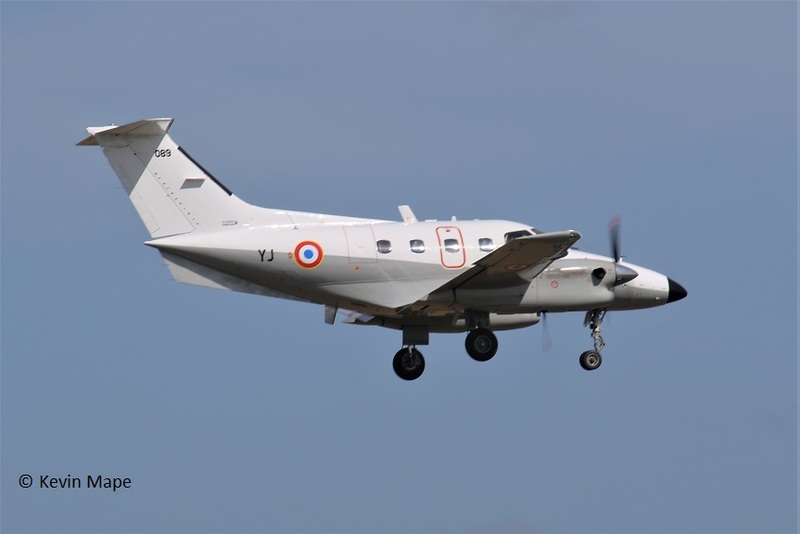 G-FRAU/AU/Cobham/Falcon 20EW c/s “Zodiac 52” – mission. ZZ419/14Sqn/Shadow c/s “Snake 49” To Sierra then later departed to Waddington. 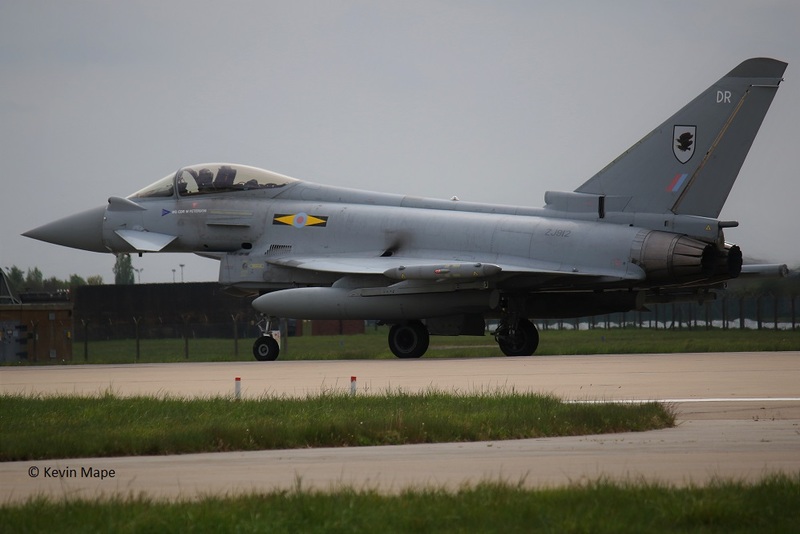 ZJ935/DJ/XI(F)Sqn – Towed from TMF. 24th Wed Log thanks to Susie,Mark & Hans. 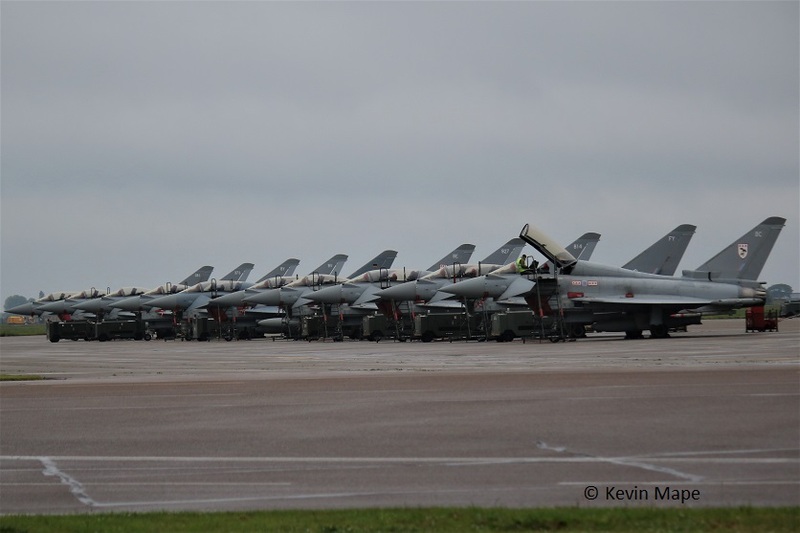 29(R)Sqn – 927,930, 810, BG, 381,342, 804, 814 BG . 41(R)TES – EB-G, EB-B ,EB-Q. EB-L, ZK315. 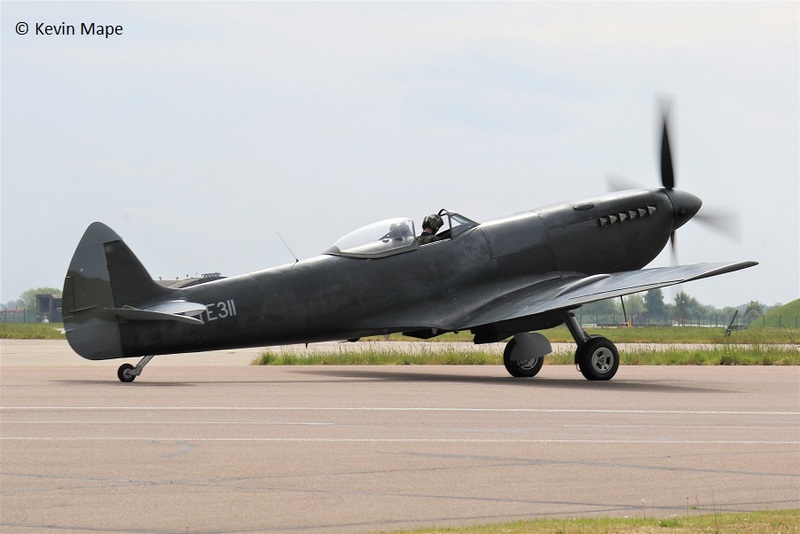 ZK322/GS code only – Towed from TMF to the ASP 20.00. 25th Thur Log thanks to Susie & Hans. ZK338/FF code only c/s “**********” – Delivery to TMF. 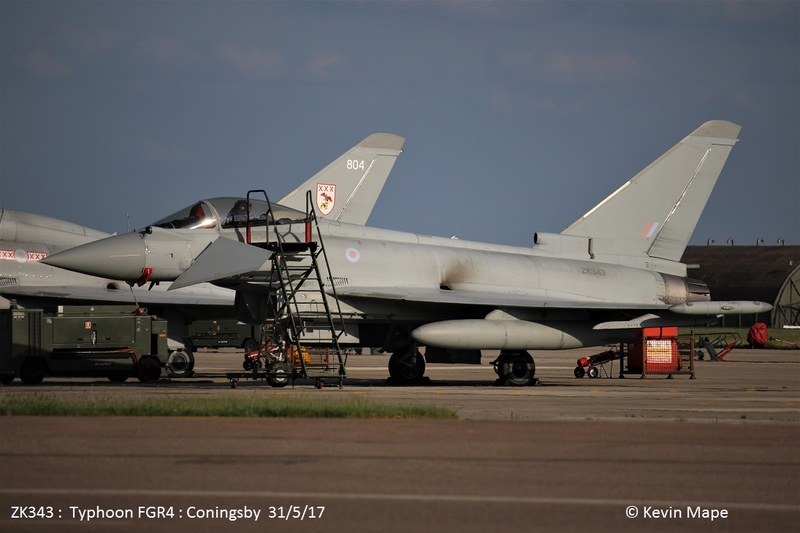 ZK368/368/II(AC)Sqn c/s “Striker 32” – First visit in marks – parked on the ASP. XX348/348/208(R)Sqn marks/Hawk T1A c/s “Pirate 19” parked on Sierra. G-FRAU/AU/Cobham/Falcon 20EW c/s “Zodiac 51” – departed. ZJ***/Apache c/s “Army Air 444” – Parked on Sierra for refuelling then departed. 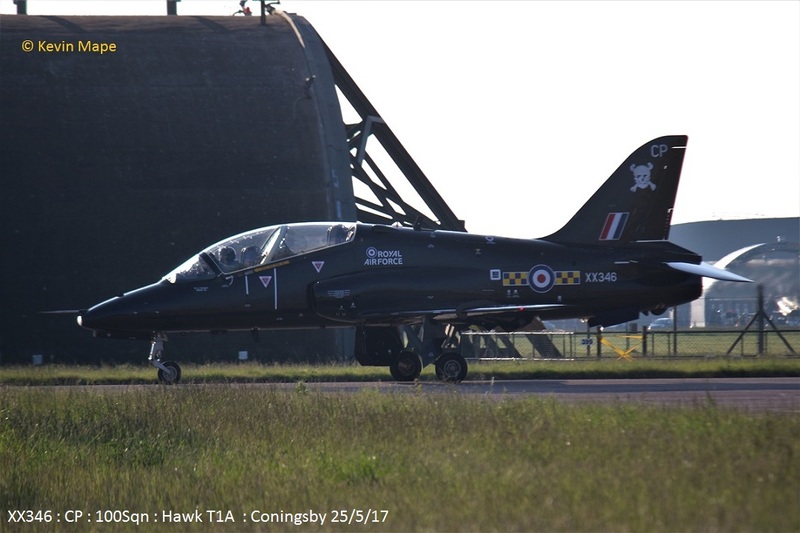 XX346/CP/100Sqn/Hawk T1A c/s “Pirate 16” – parked on Sierra. 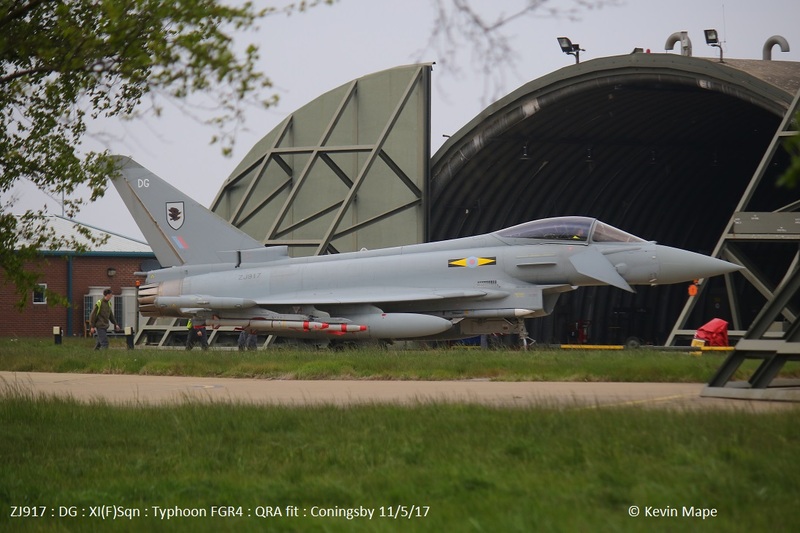 ZK352/BV code only c/s “Typhoon 45” – To Duxford. ZK354/BY code only – Parked on the ASP. 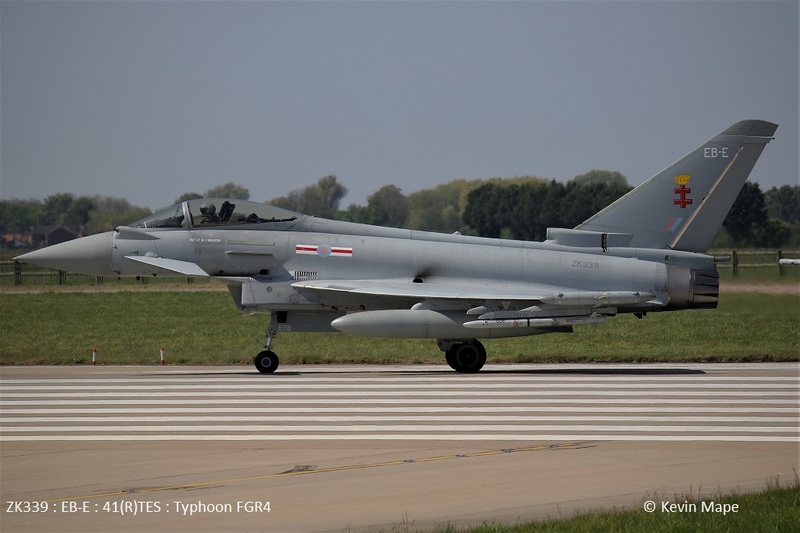 ZK354/BY code only c/s “Typhoon 45” – To Duxford. ZJ927/927 code only – Parked on the ASP. 30th Tue Log thanks to Steve, Val & Garf. 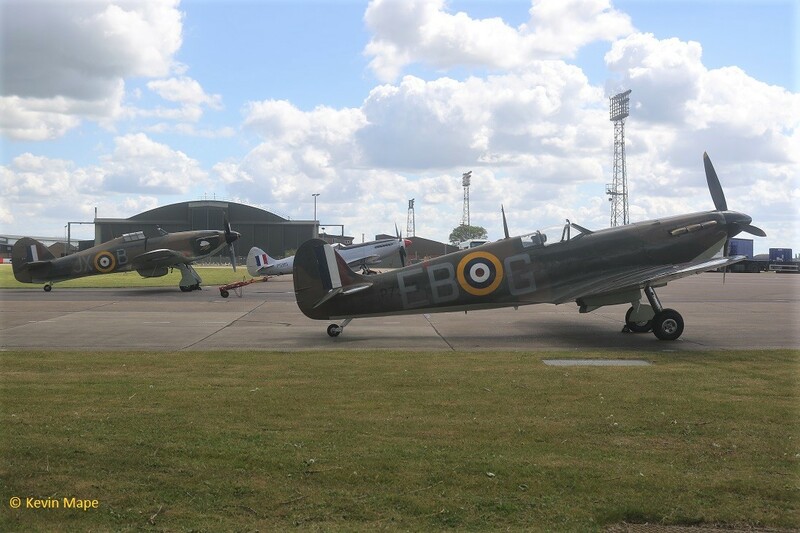 ZK354/BY code only – parked outside the west side of 29Sqn Hangar with :-. 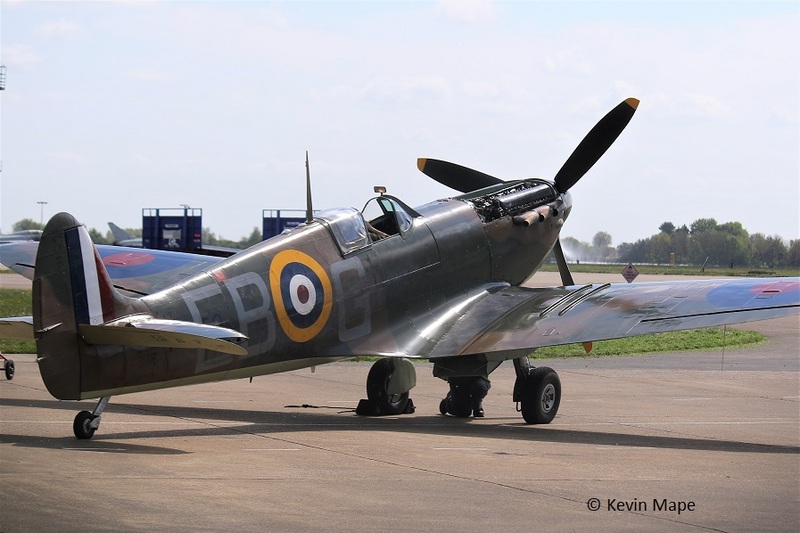 ZK322/GS code only – towed from TMF southside to Hangar 2. 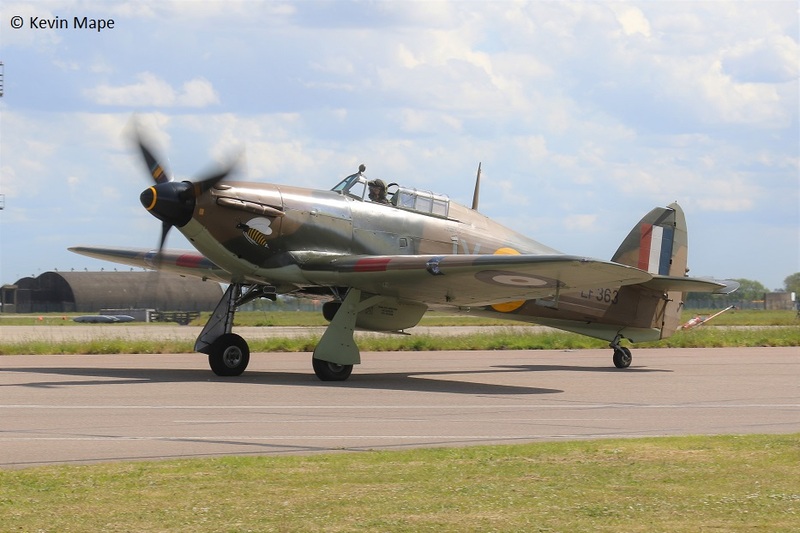 PZ865/EG-S/Hurricane IIc noted outside BBMF – no engine covers on. ZK322/GS code only – towed from Hangar 2 to southside of TMF. G-FRAH/AH/Cobham/Falcon 20EW c/s “Zodiac 52” – To Durham Tees side. 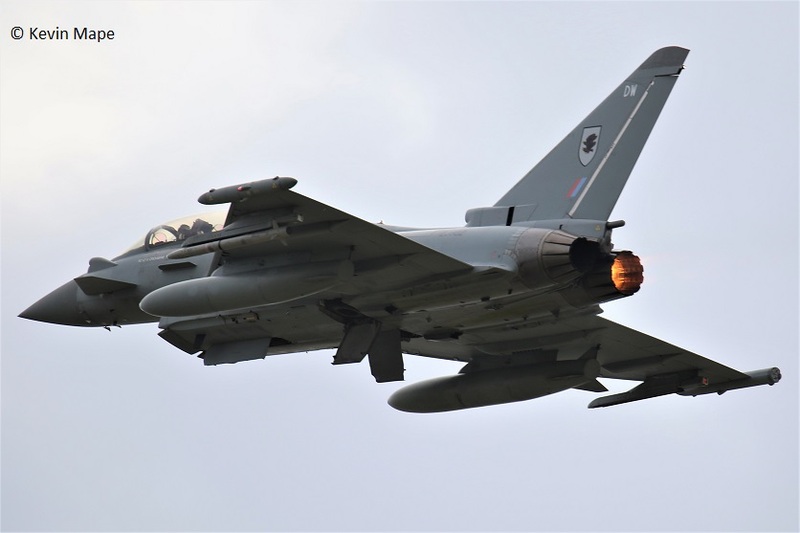 ZJ929/DL – QRA radio check. 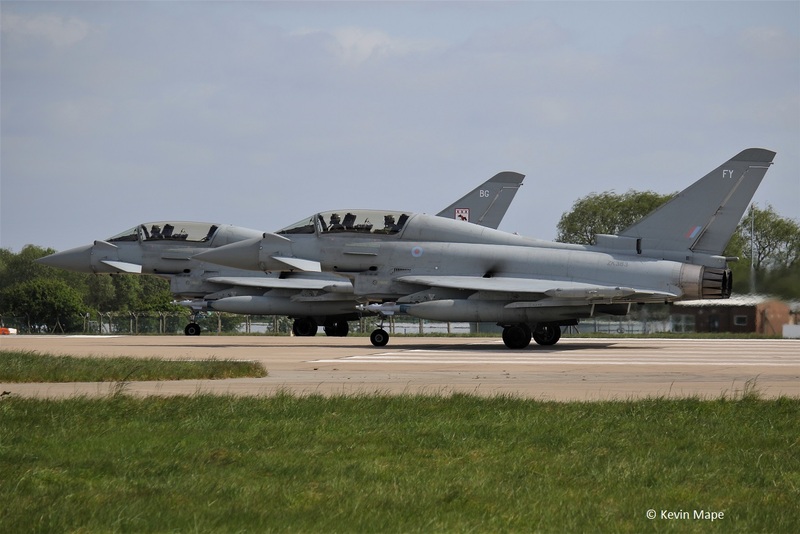 ZJ942/DH/XI(F)Sqn – Has 1 to Echo HAS 7. 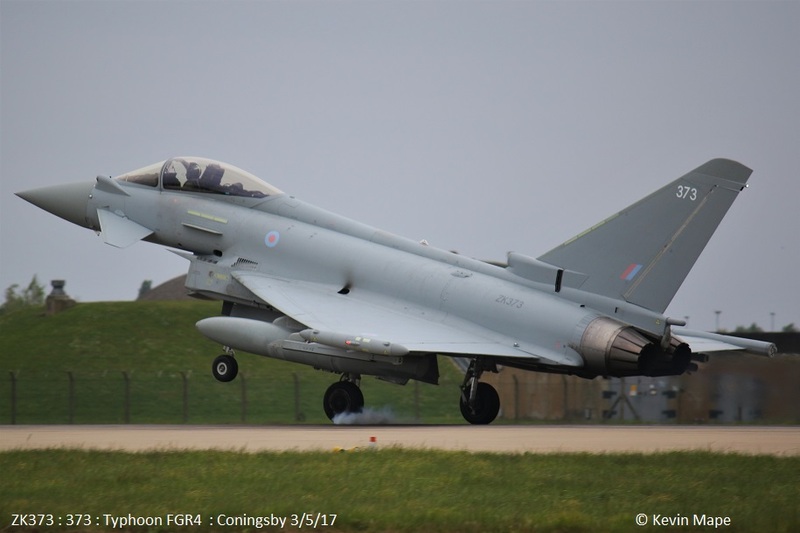 ZK343/Unmarked c/s “Lossie 92” – From Lossiemouth. 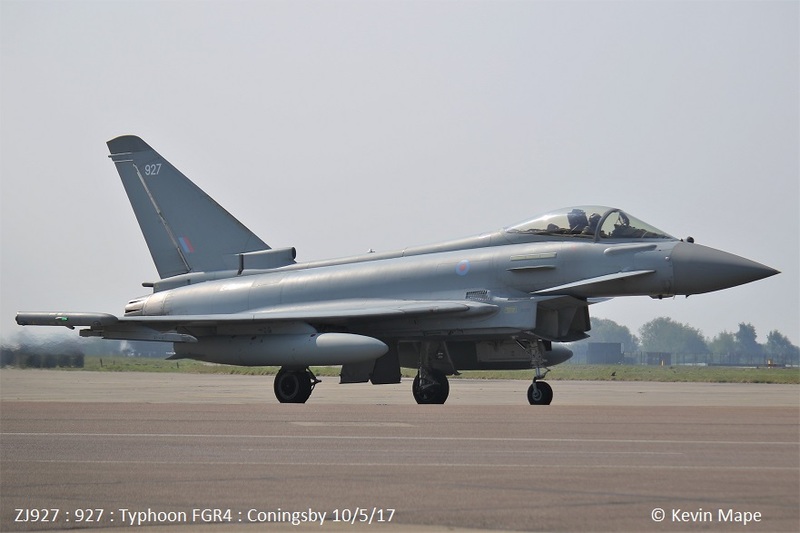 ZJ914/DZ/XI(F)Sqn c/s “Y9G 32” – practice QRA. ZK329/329 code only c/s “Lossie 92” To Lossiemouth ( ex FH/1(F)Sqn) f/n with 329 code. ZJ916/S code only – Partly stripped paint on Fuselage noted on the ASP 6:00 pm. ZK328/328 code only – Engine runs on the ASP. I would like to say a big thank you to all the people that have passed on Logs, Without those people this section would not exist. ZJ916 : S : code only : Towed to the Paint shop from TMF – 3/5/17. ZK307 : O : code only : – mods. Towed onto the ASP 4/5/17. ZK366 : Unmarked : Noted on the ASP 27/4/17 .Noted on the ASP 11/5/17.